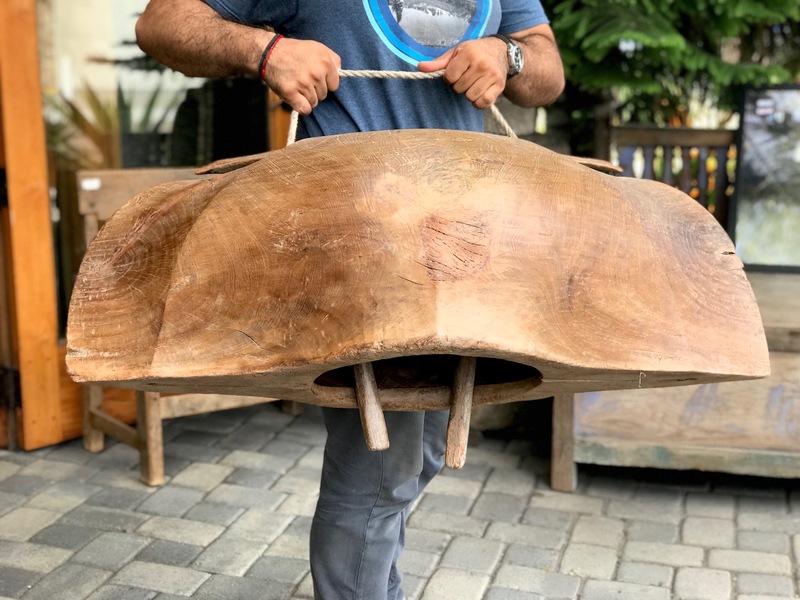 Vintage Chinese Hanging Tiger Drum (top view), wood, metal tacks, hide, paint, 60″ x 35″, $5500. 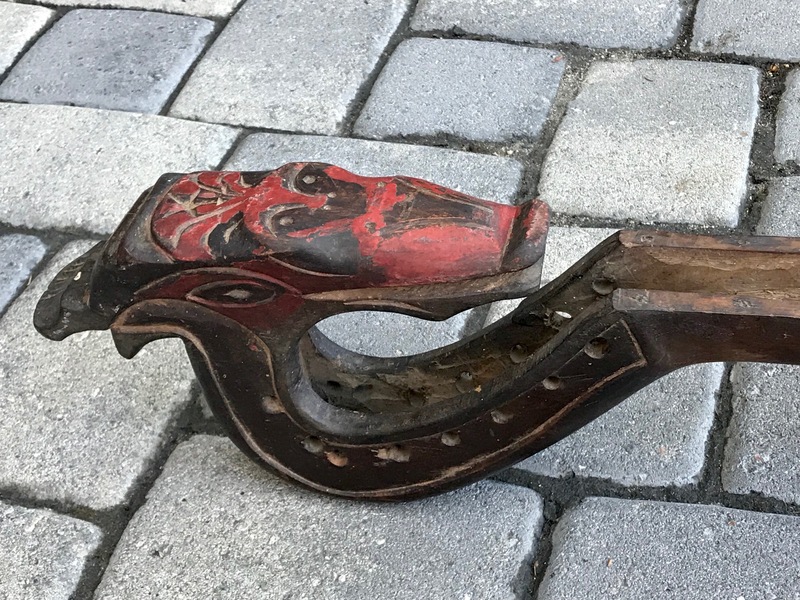 Early 19th c, Keyaki (zelkova) wood, hide, red pigment, metal tacks, carved from one piece of wood, ink, 19″ x 18″, $1250. 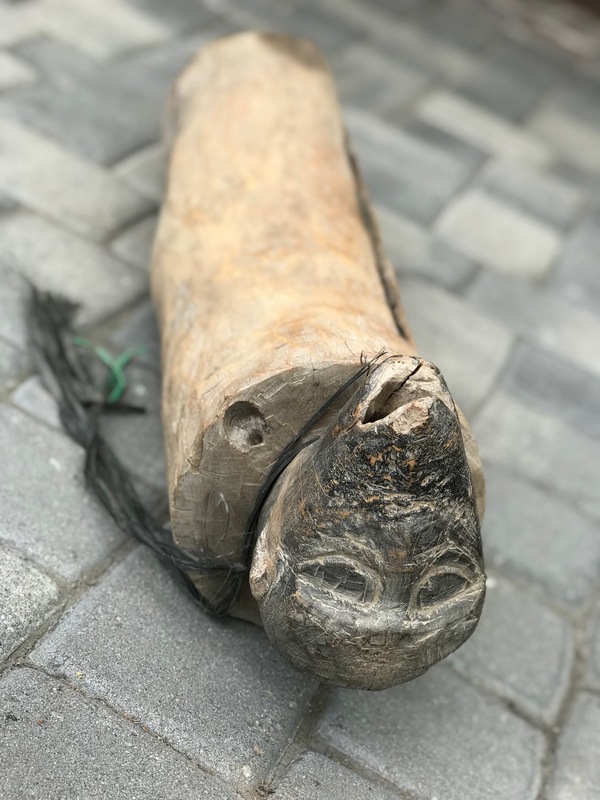 19th c, (new head skin and tacks), Keyaki wood, hide, rope, iron rings and tacks, ink/paint, carved from one block of wood; 20″ x 24″, $1200. 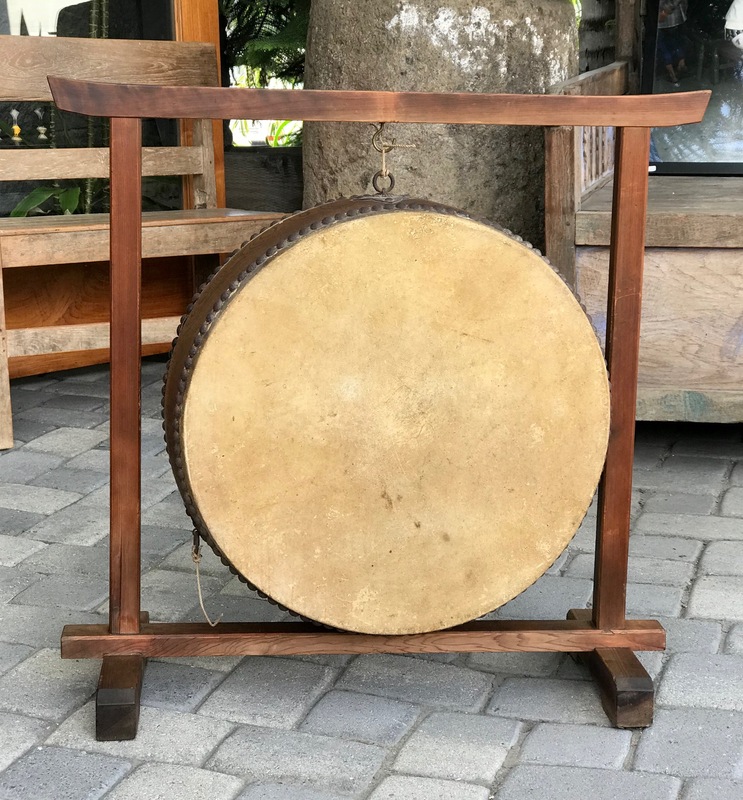 19th c, Buddhist Drum, Keyaki (zelkova ) wood, metal panel on side, metal tacks on rawhide skin (missing center of drum head skin both sides) Metal ring with rope for carrying, carved from one block of wood; 29 1/2″ x 34″, $2800. 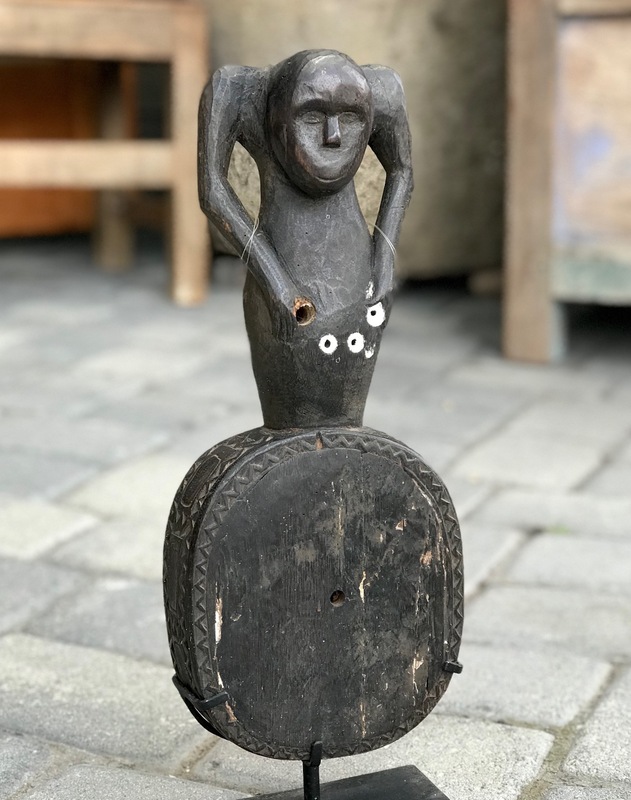 Wood, hide head painted with black and gold ‘Tomoe’ symbol (circular, turning motif referring to motion of the earth and play of forces), metal tacks, 18 1/4″ x 6 1/2″ ; frame – 52 1/2″ x 30 1/2″, $650. 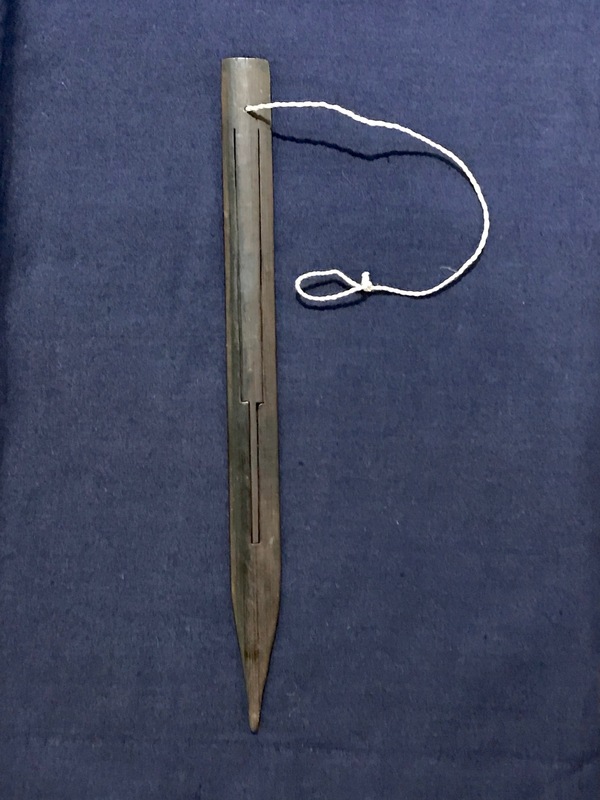 Wood and metal frame, hide skin tacked down. 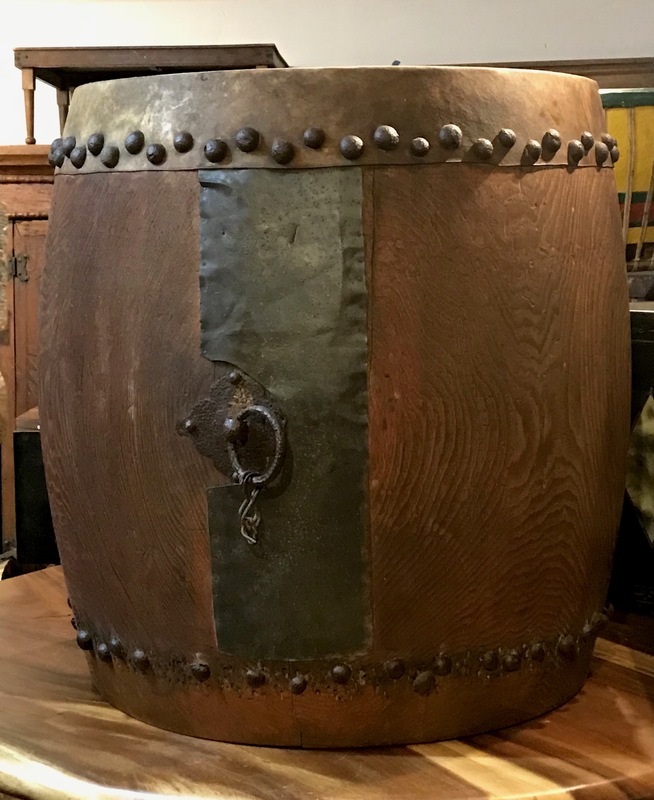 21 1/2″ x 6″, (30″ x 27″ x 13″ with stand), $750. 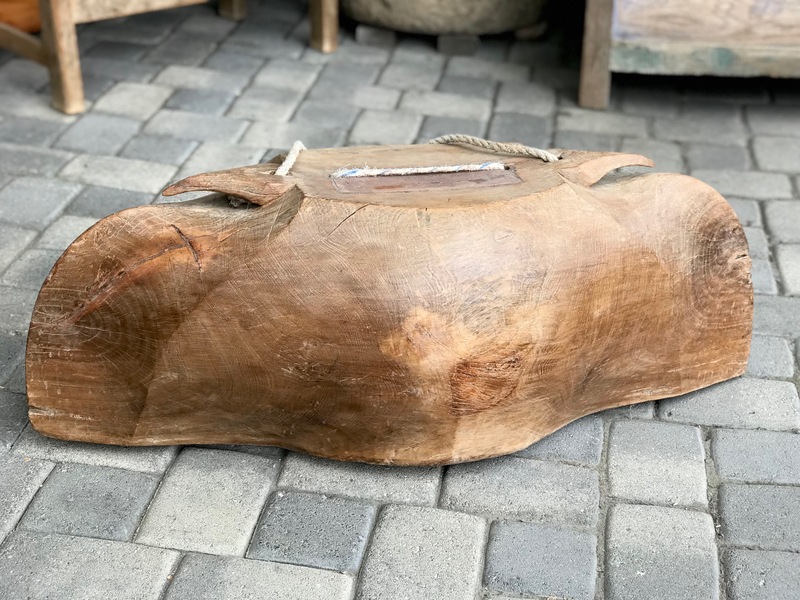 Indonesia, Wood, paint, hide, left to right – 27 1/2″ x 16″ $295. ; white/front- 20 1/2″ x 12″, $225. 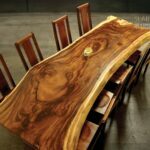 ; 25 1/2″ x 13″, $280. 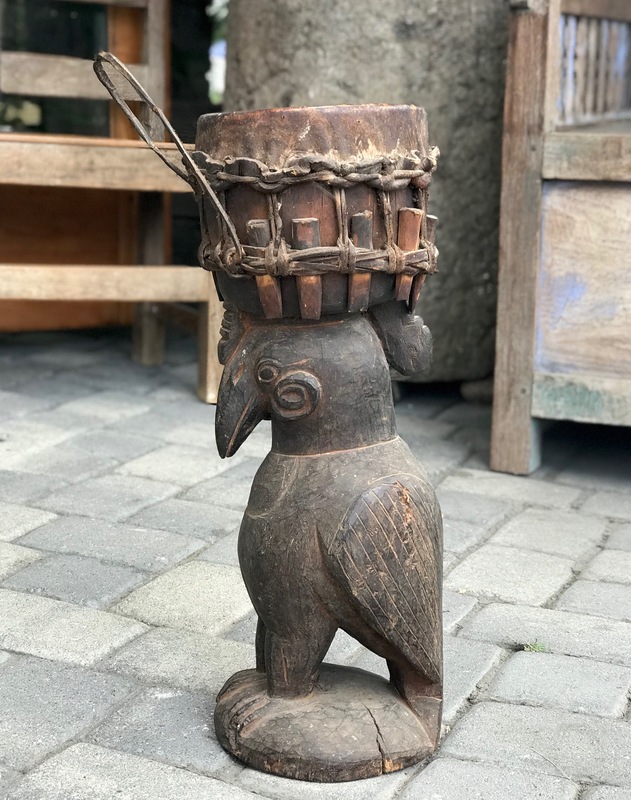 Sumba Island, Indonesia, Mid 20th c, hardwood, rawhide, strap and peg style head, The Hornbill is a religious symbol of great antiquity. 22″ x 7″ x 8″; $1100. 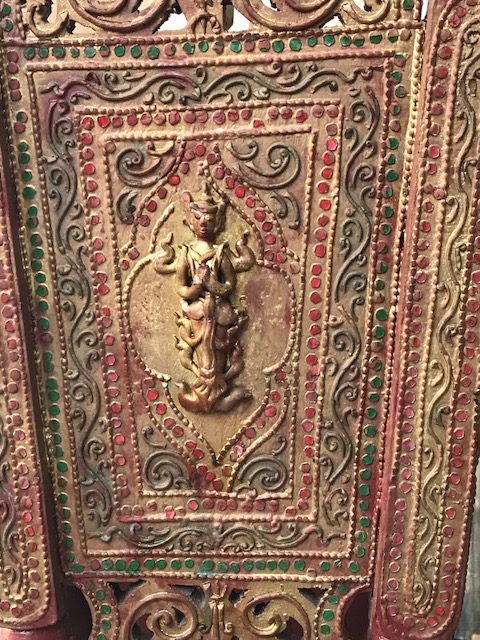 Hand carved wood frame and stand, bronze, rope, cloth, – 32 1/2″ x 36″ x 12″ (Frame – 17 1/2″ x 6″), $2400. 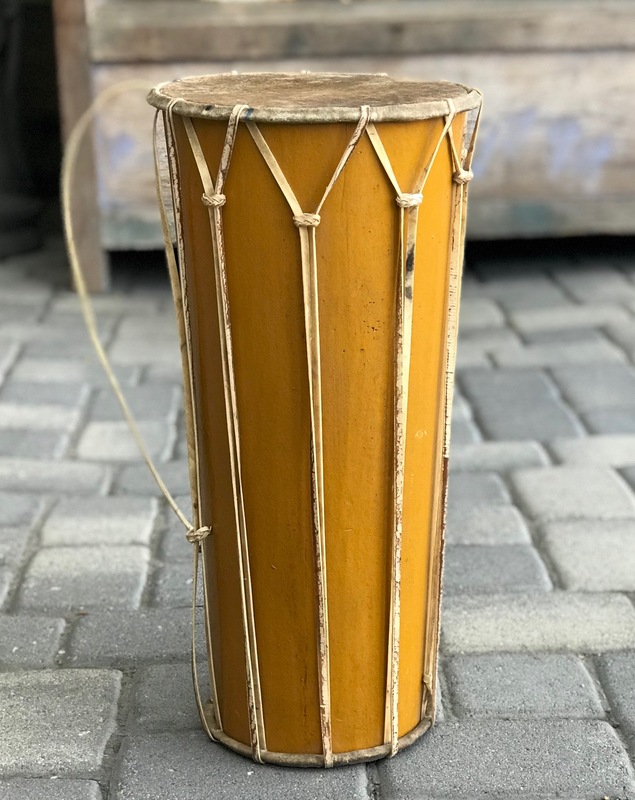 Bali, Indonesia, wood, paint, This type of percussion instrument was developed and used by people in forested areas as its sound will carry far through the surrounding jungle and rice fields. 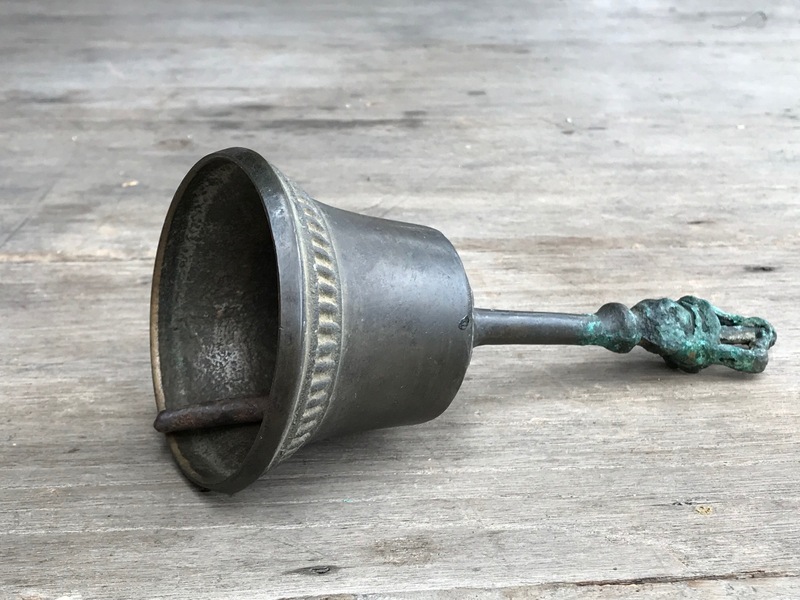 Often hung or placed in a drum pavilion or tower and used to call villagers to meetings, or other events by tapping out a signal. 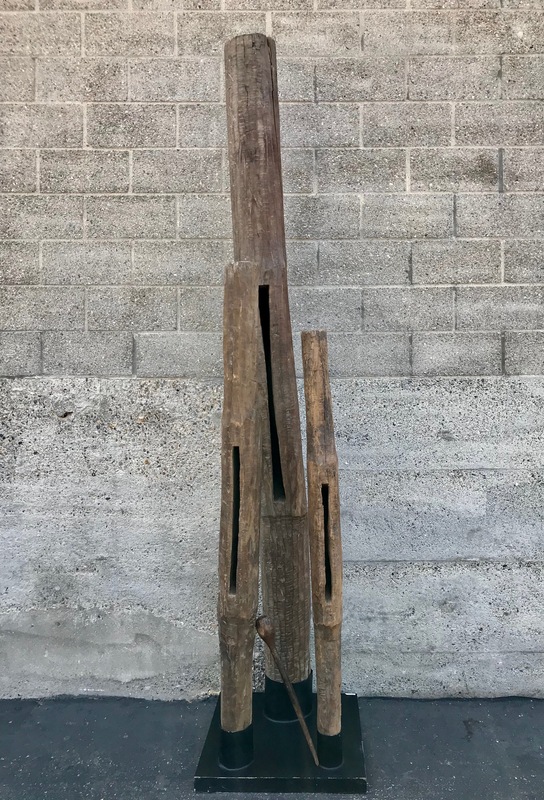 Left – 39 1/2″ x 7 1/2″ x 7″, $950. ; Right – 34 1/2″ x 7″ x 7″, $590. Musical Instrument and long distance jungle communication system. 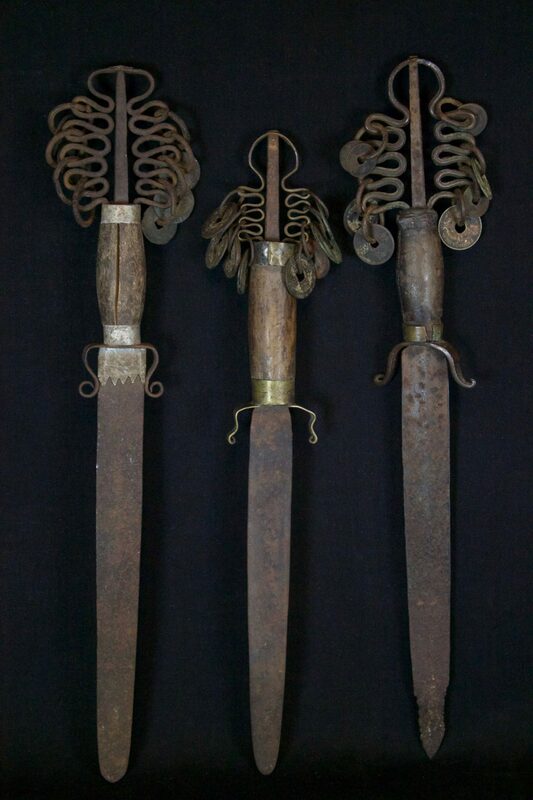 Sumba Island, Indonesia, Teak wood, each one of these three large gongs has been carved from a single piece. 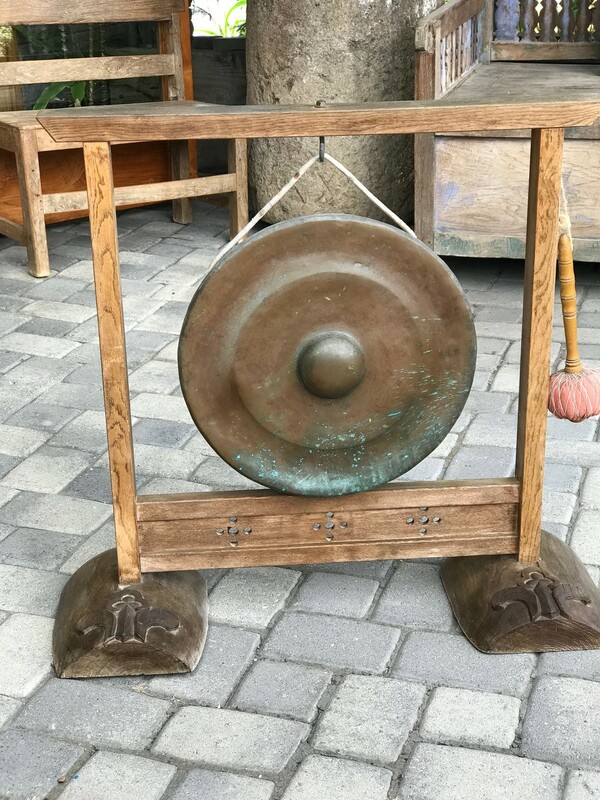 This type of gong or drum was developed and used by people in forested areas. 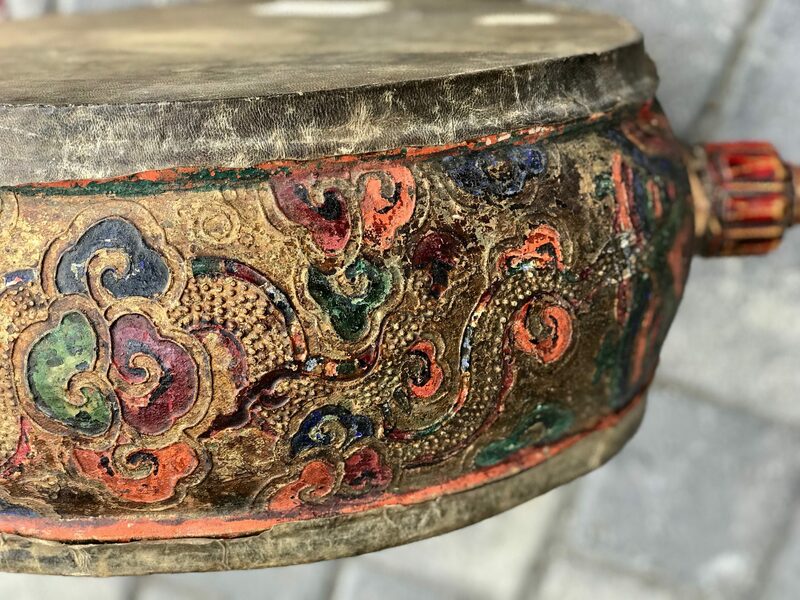 Its sound will carry far through the jungle and rice fields. 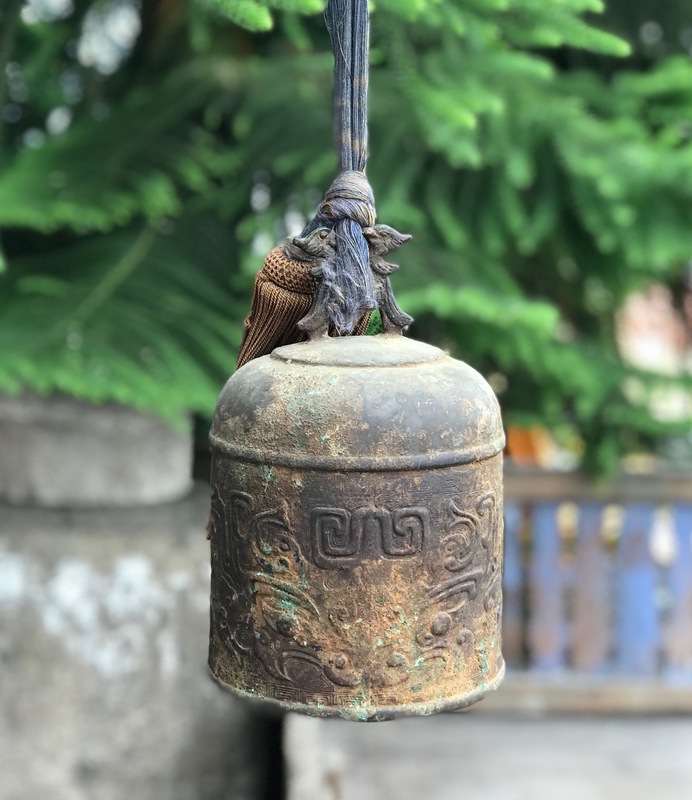 Often hung or placed in a drum pavilion or tower, it was used to call villagers to meetings or other events by tapping out a signal. base is 33 1/2″ square, height is 108″ (tallest) $2800. 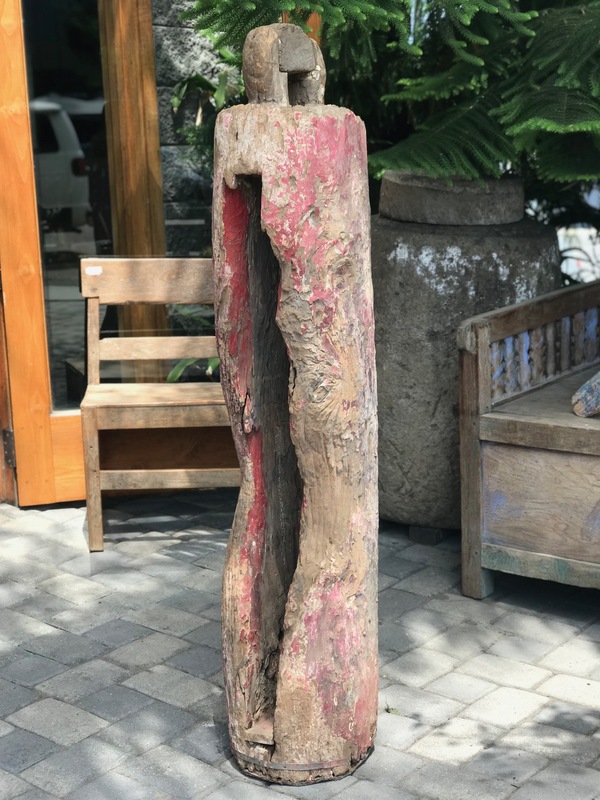 Indonesia, Early 20th c, hardwood, paint, (see 1st Slit Gong post for full description) 28″ x 64″ x 15, $2400. 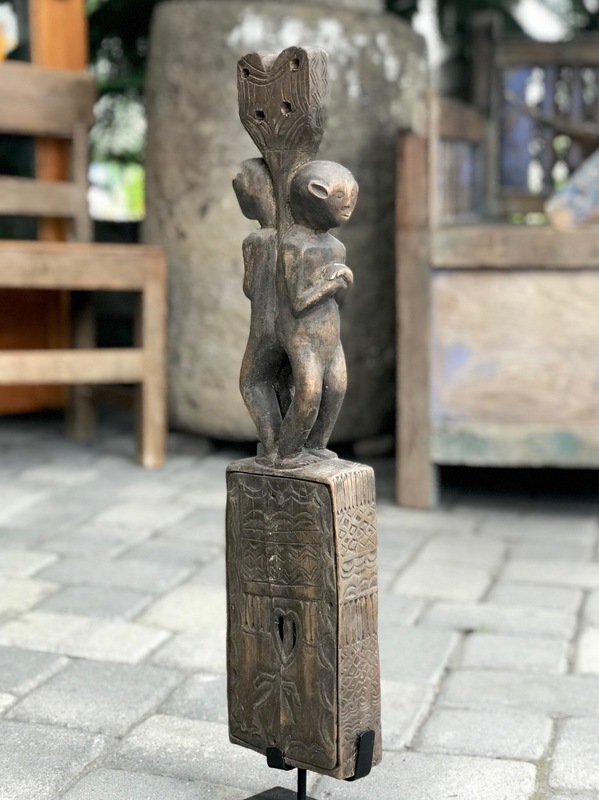 Indonesia, wood, paint, animal form with a beautiful age patina, (see 1st Slit Gong post for full description) 12″ x 34″ x 9″, $750. 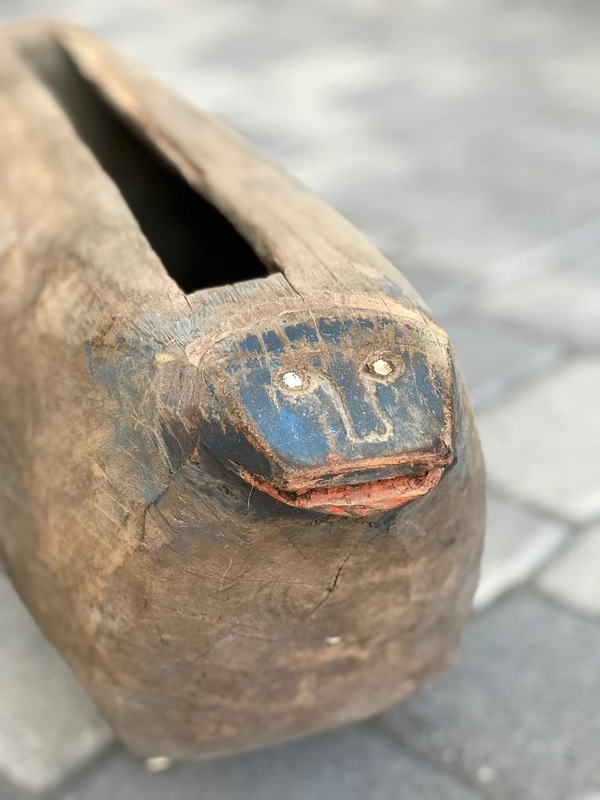 Indonesia, Jackfruit wood, paint, brown paint over an older bright blue. 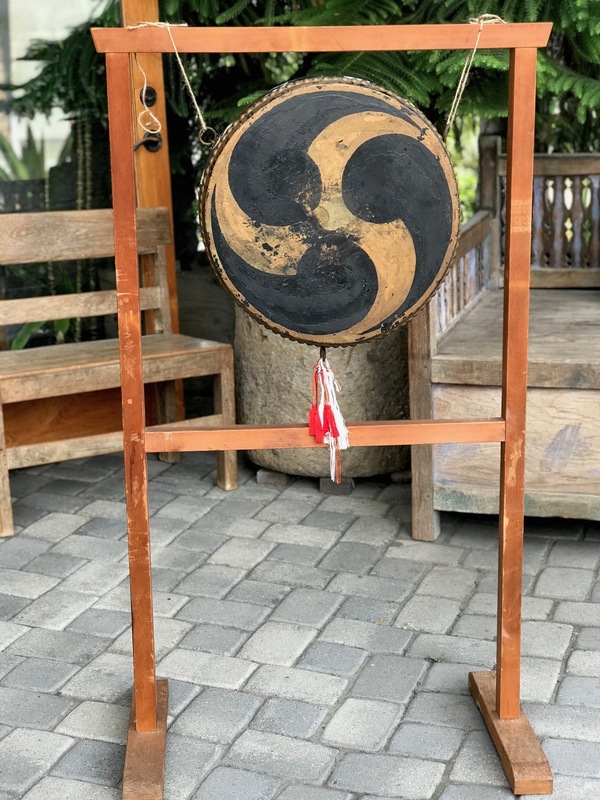 with an age patina, (see 1st Slit Gong post for full description) 13 1/2″ x 37″ x 9″, $475. 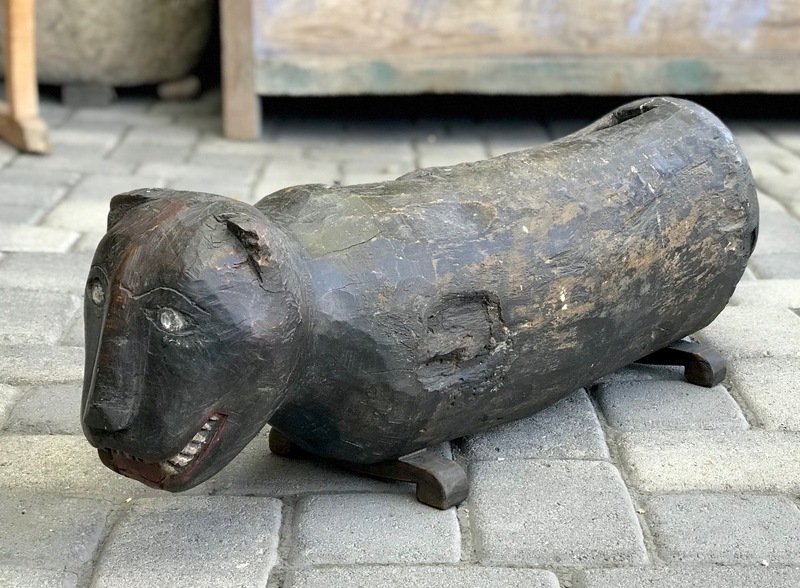 Indonesia, wood, horse/snake animal with a beautiful age patina, (see 1st Slit Gong post for full description) 13 1/2″ x 43″ x 13″. $1250. 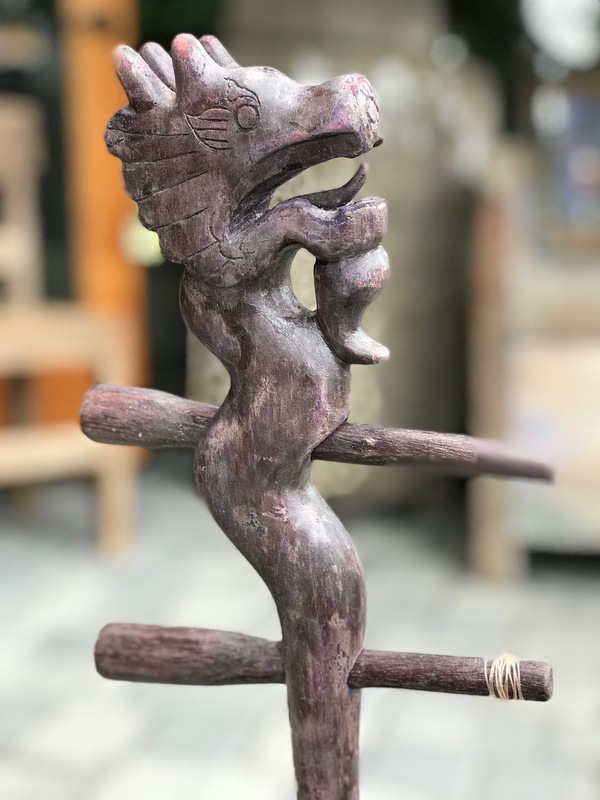 Indonesia, wood, paint, animal form, (see 1st Slit Gong post for full description) 9 1/2′” x 30″ x 6″, $370. 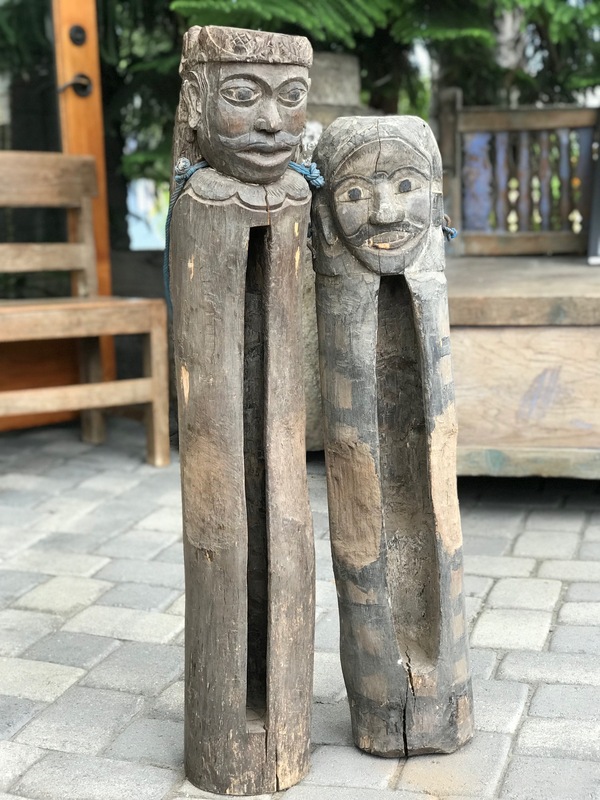 Indonesia, wood, Early 20th c, hardwood, paint, (see 1st Slit Gong post for full description) 8 1/4″ x 29″ x 96″, $390. 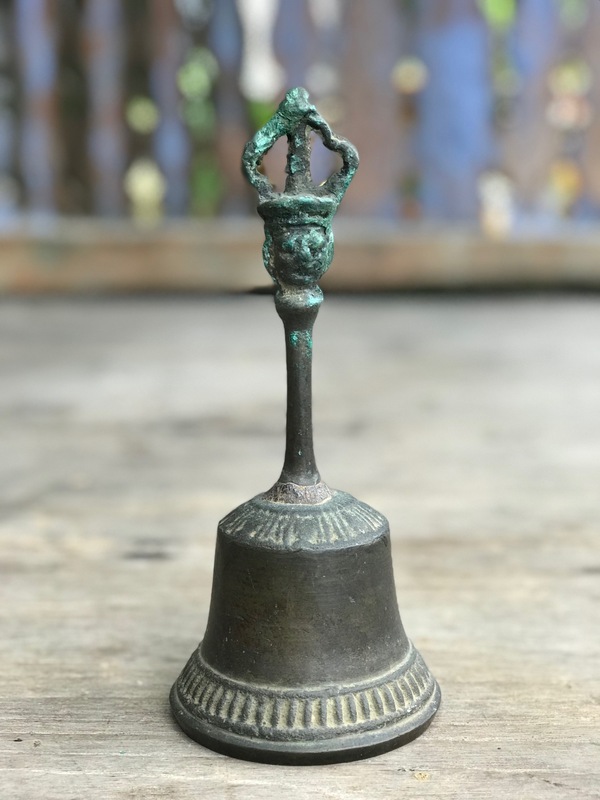 In Kodi, as in the rest of Sumba, the most powerful, sacred music is played on gongs. 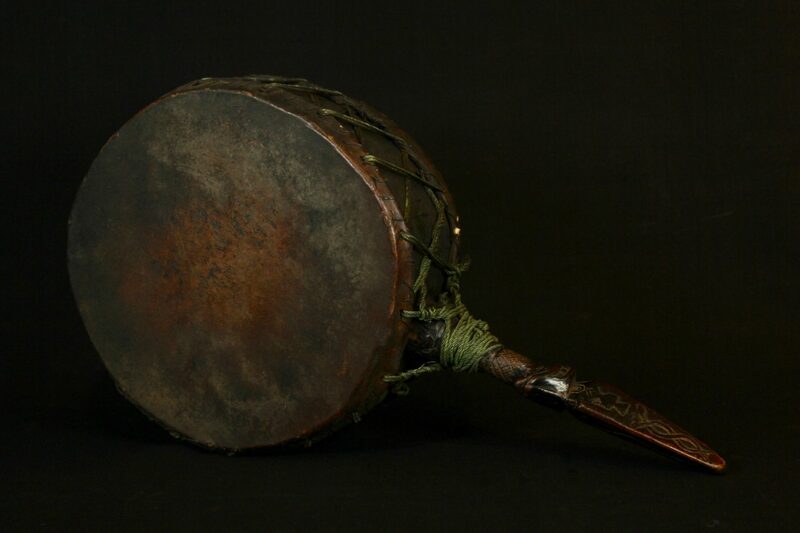 Played in interlocking rhythms with one or two gongs to a player, the music is closely tied to Marapu ritual and ceremony, especially funerals. 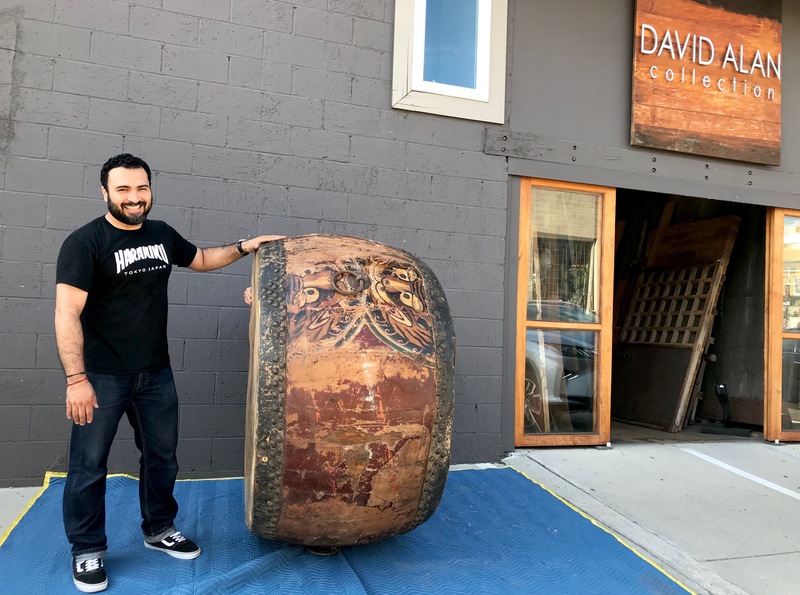 13″ x 58″ x 12″, $1050. 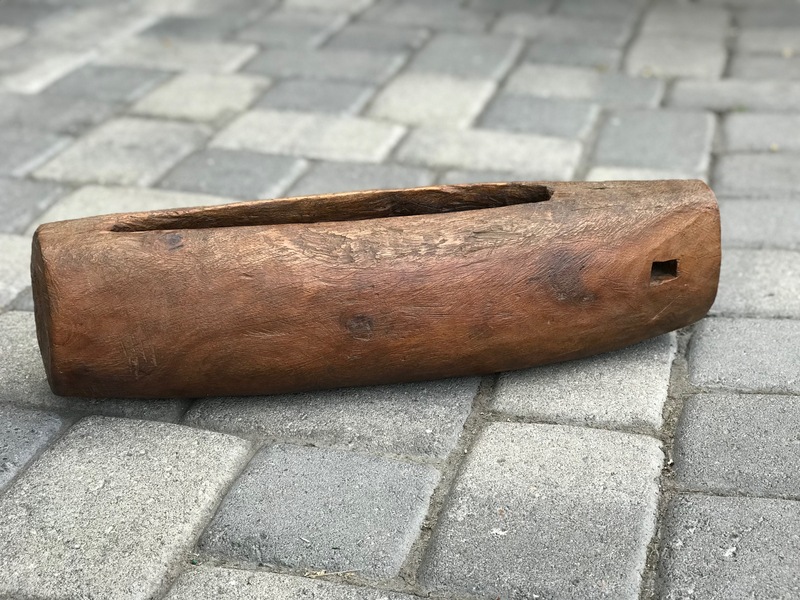 Indonesia, Jackfruit wood, (see 1st Slit Gong post for full description) 6″ x 20 1/2″ x 5″, $145. 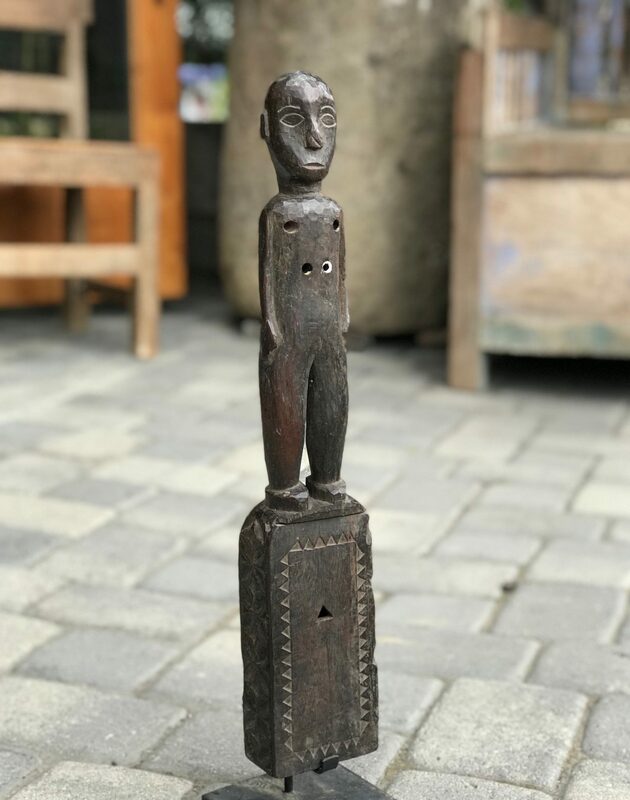 Kodi village, Sumba Island, Indonesia, early 20th c, hardwood, pigment, anthropomorphic figure, The music is closely tied to ritual and ceremony, especially funerals. 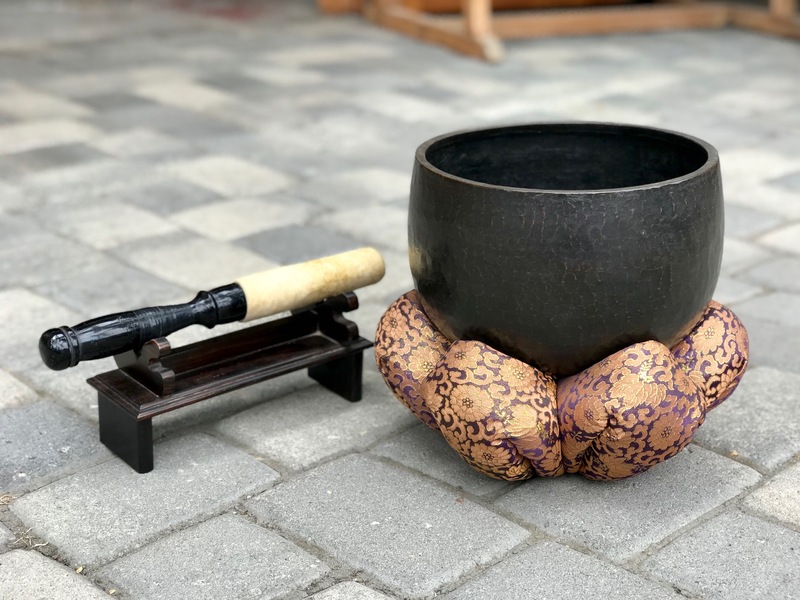 Unlikely as it seems from the looks of it, the dungga exists in the same musical world of slot drums/gongs, taking those rhythms and transferring them to its four strings. 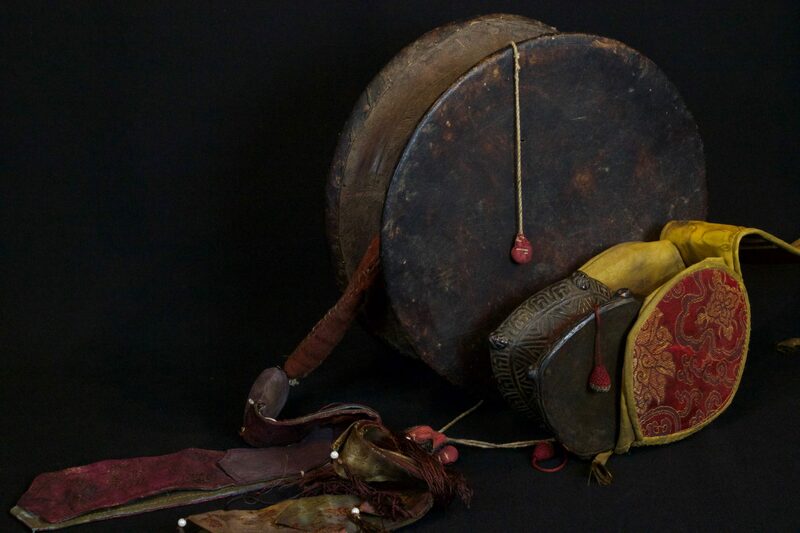 While gong ensembles can have seven or more instruments, the dungga’s four strings are enough to replicate most gong melodies: the high string, plucked by the left hand, replicates the metronomic sounds of the smallest gong, ngaha; the two inner strings play the sound of the “middle” gongs, dopoduyo, while the lowest string plays the part of the large gong or kaduka; 23 1/2″ x 3 1/2″ x 4″ (with stand – 25 1/2″ x 5″ x 4 1/2″), $460. 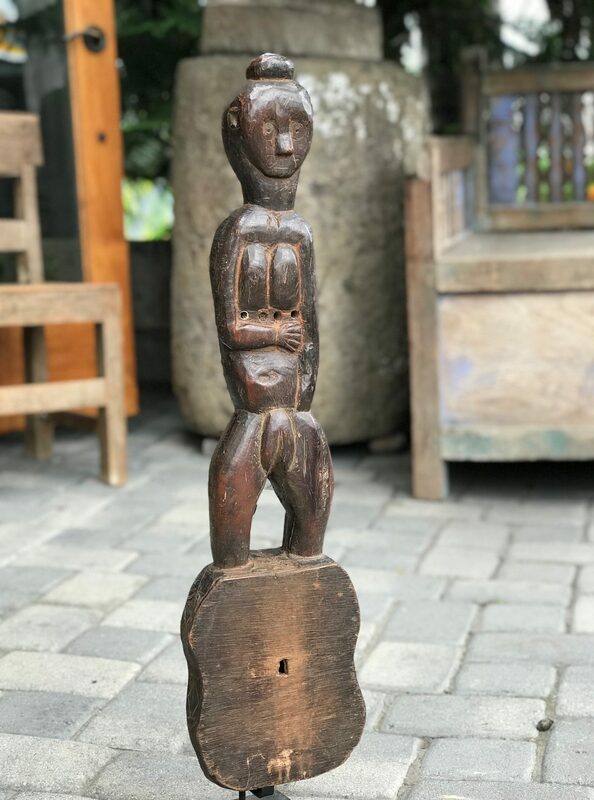 Indonesia, Early 20th c, wood, (see 1st Dungga post for full description) 28 1/2″ x 7 1/4″ x 3 1/4″, $360. 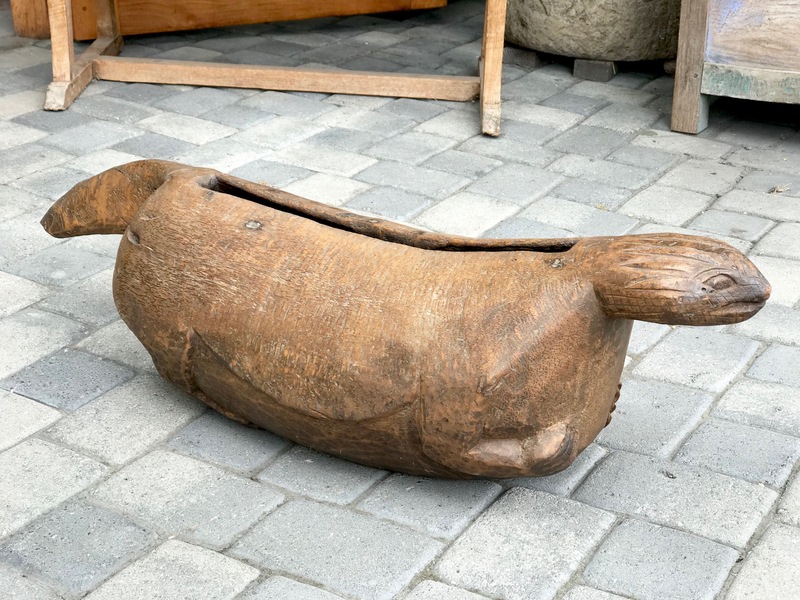 Indonesia, Mid 20th c, wood, (see 1st Dungga post for full description), 20 1/2″” x 3 3/4″ x 2 1/4″, (22 1/2″ x 4 3/4″ x 4 3/4″, $375. 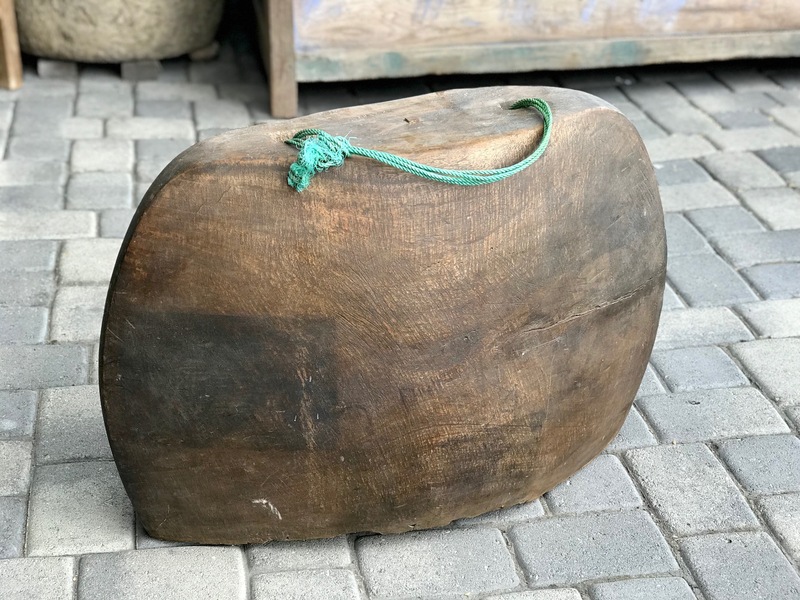 Indonesia, Early to mid 20th c, wood, (see first Dungga post for full description) 19 1/2″” x 4″ x 2 3/4″, (21 1/2″ x 5 1/4″ x 4 1/4″ , $380. 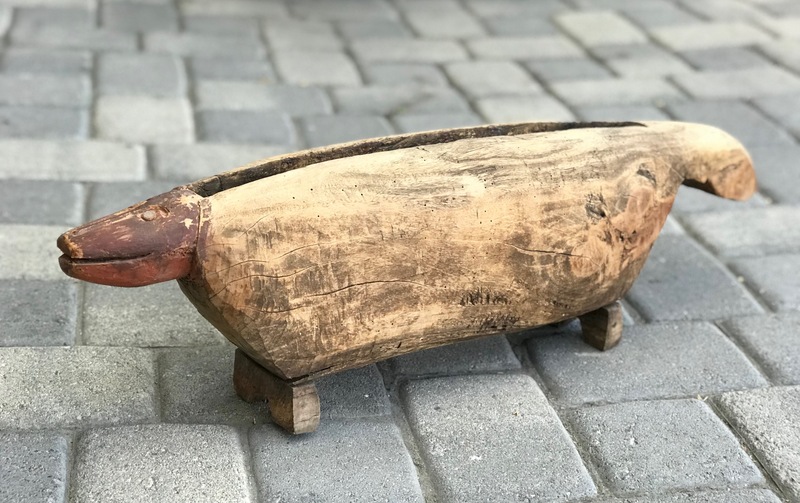 Indonesia, Mid 20th c, wood, (see 1st Dungga post for full description), 14 1/2″ x 6 1/2″ 2 3/4″ (with stand – 16 1/2″ x 5 3/4″ x 3″), $320. 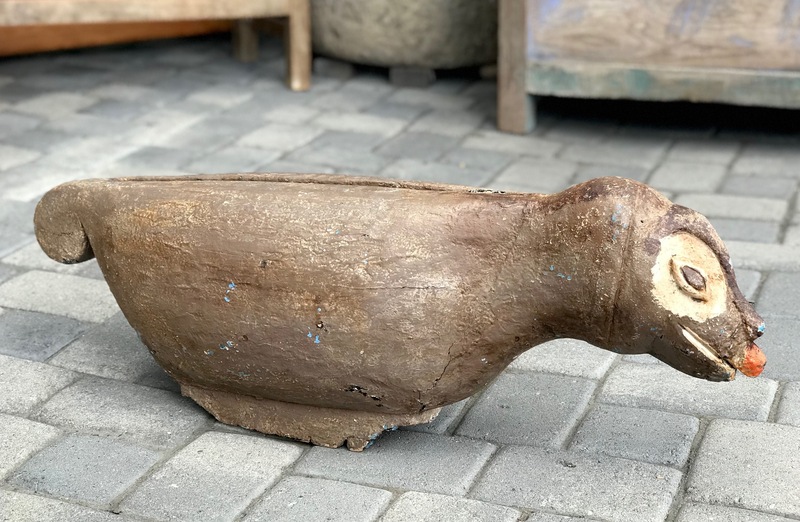 Indonesia, hardwood, pigment, (see 1st Dungga post for full description); 23 1/2″ x 5 1/4″ 2 3/4″ (with stand – 26 1/4″ x 6″ x 4″), $450. 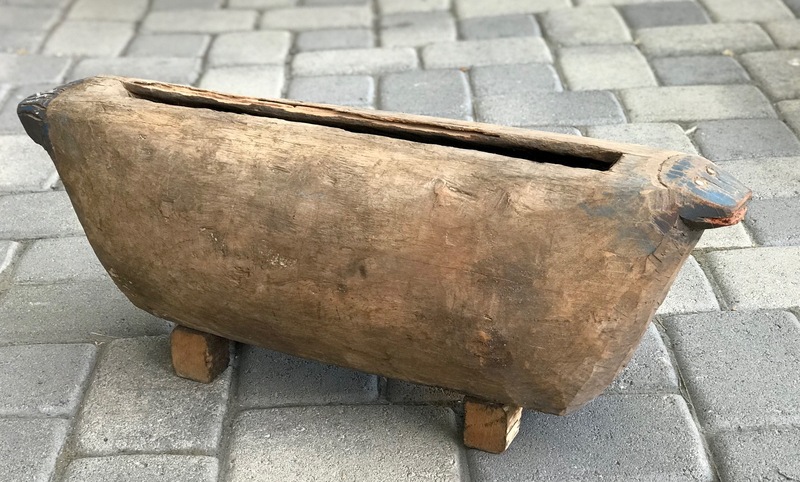 Insonesia, Early to mid 20th c, wood, (see 1st Dungga post for full description), 25″ x 5 1/4″ x 4″, $380. 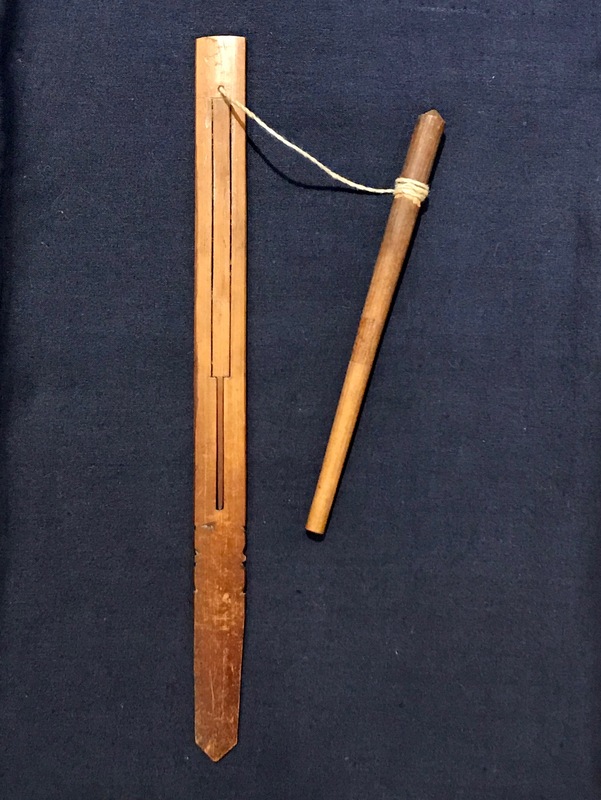 Gambus – A traditional Indonesian tribal instrument. 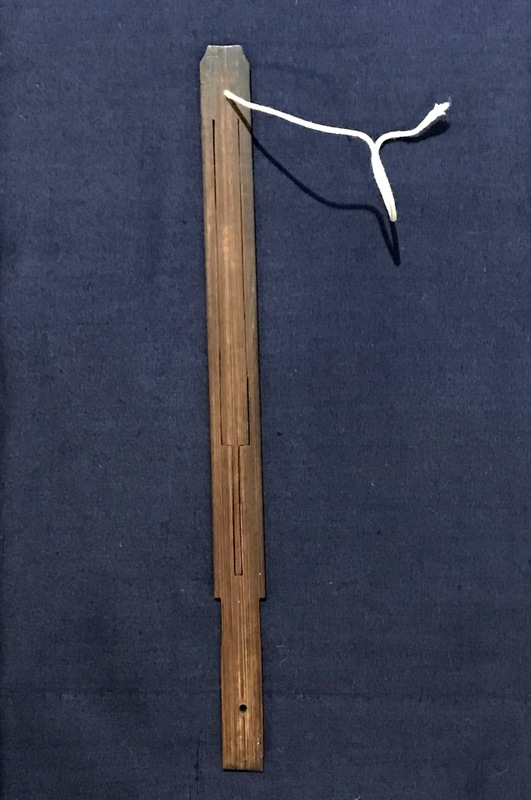 Gambus – Lute-like instrument made by the Batak people of Sumatra. This was carved from a single piece of wood, had 7 strings and a skin covered resonator box. 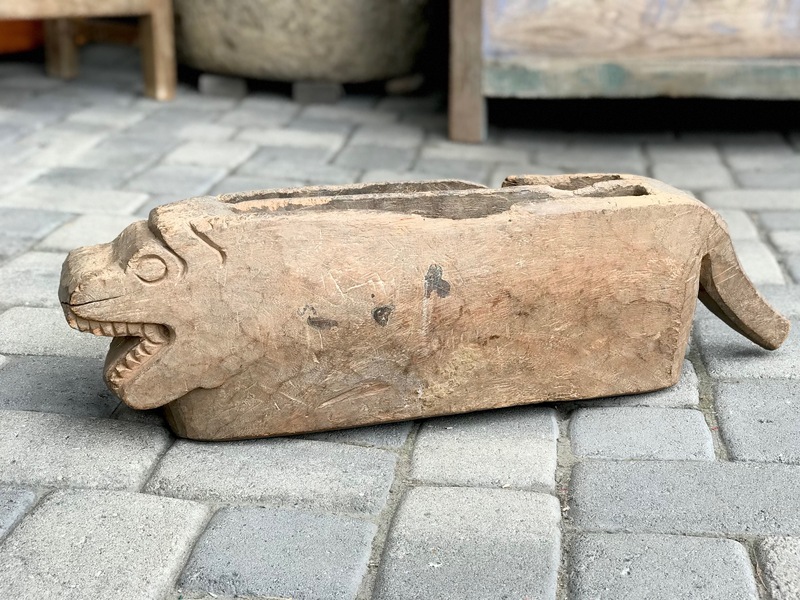 The peg box is carved with a zoomorphic head. It has no frets and would be played with a plektrum. Popular throughout Indonesia. Originating from the Arabian peninsula, the styles vary from 3 to 12 strings. 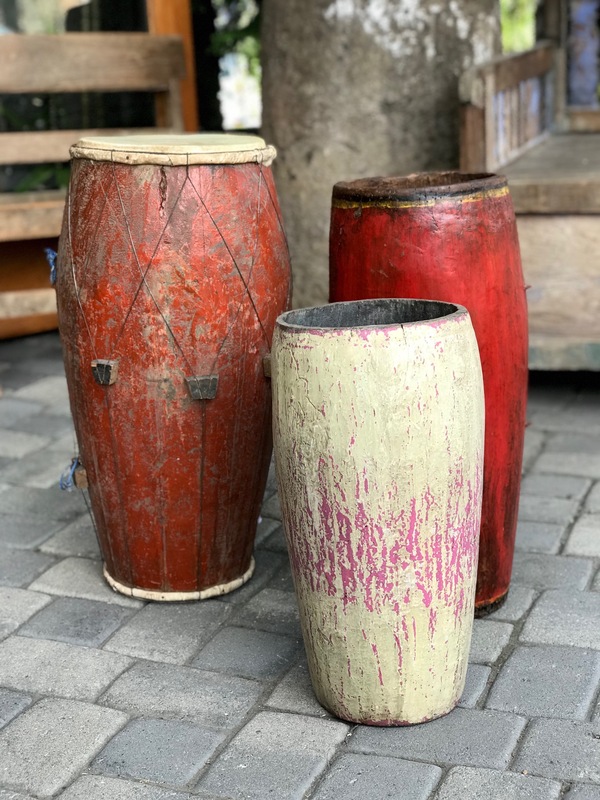 38″ x 8″ x 7″, $425. 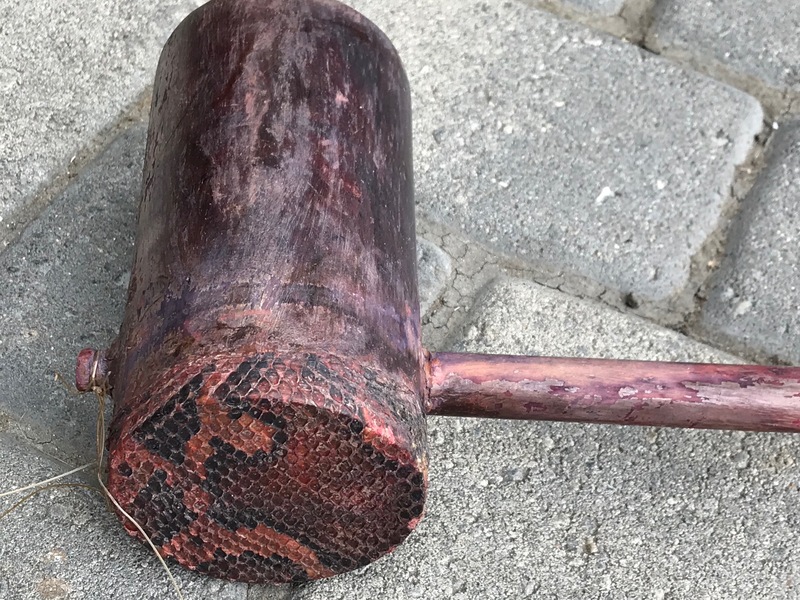 China, Wood, snakeskin, pigment, The Erhu is one of the most important Chinese instruments with a 4000 year history. It is played vertically and is incredibly expressive. It you have a sound associated with China, it is the Erhu. 29 1/2″ x 3 1/2″ x 6 1/2″, $400. 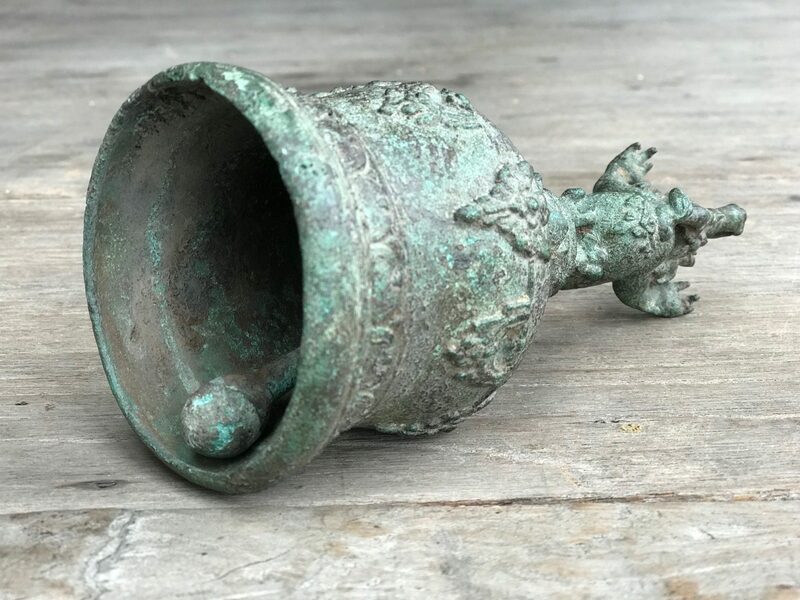 Antique Japanese Bell is played with an unattached striker. 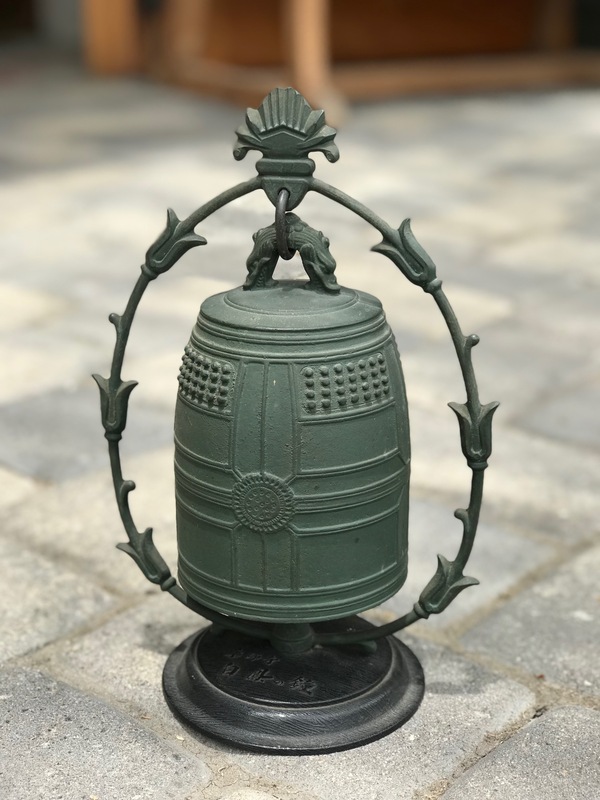 Cloth handle strap and tassel, Bronze, 9 1/2″ x 6″, $1200. 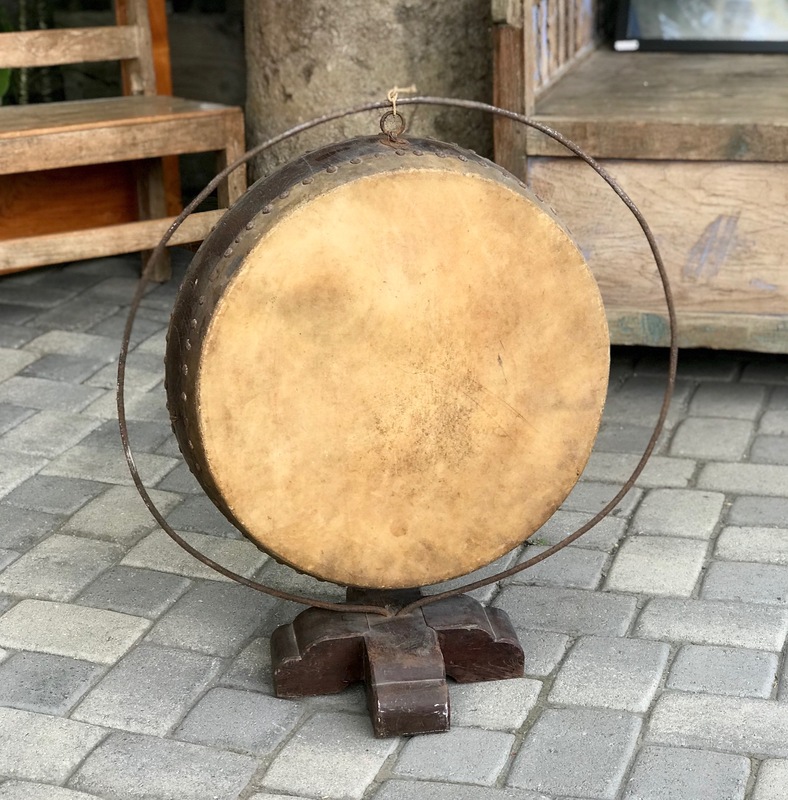 Early 20th c, clapper missing, 22″ x 33″ x 12″, $425. 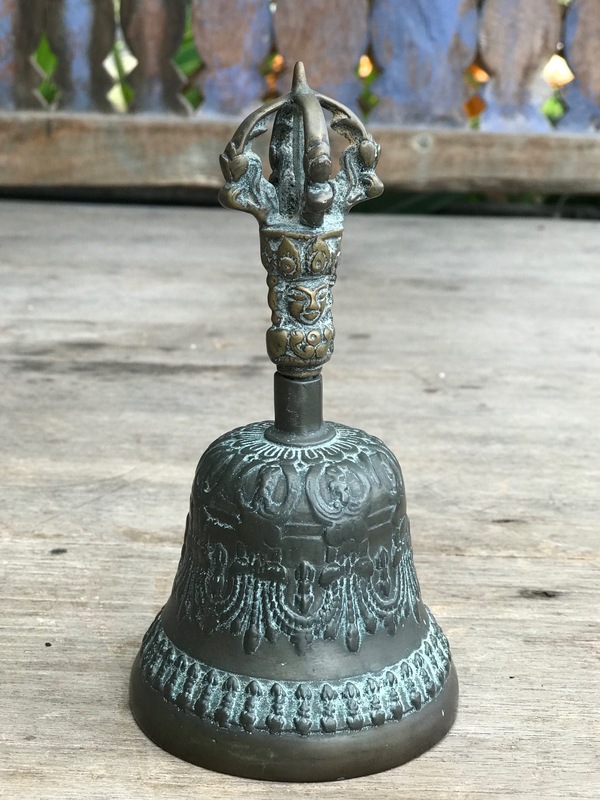 Early 20th c, Vintage reproductions of Bells that are thousands of years old. 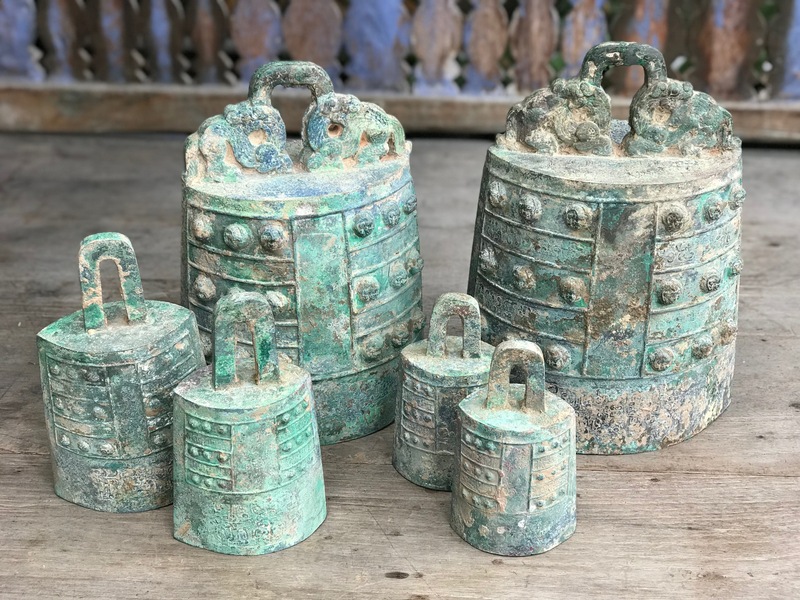 Around 2000 BC, Chinese musicians worked with foundry technicians to cast matched sets of bronze bells of different sizes to produce a range of tones. 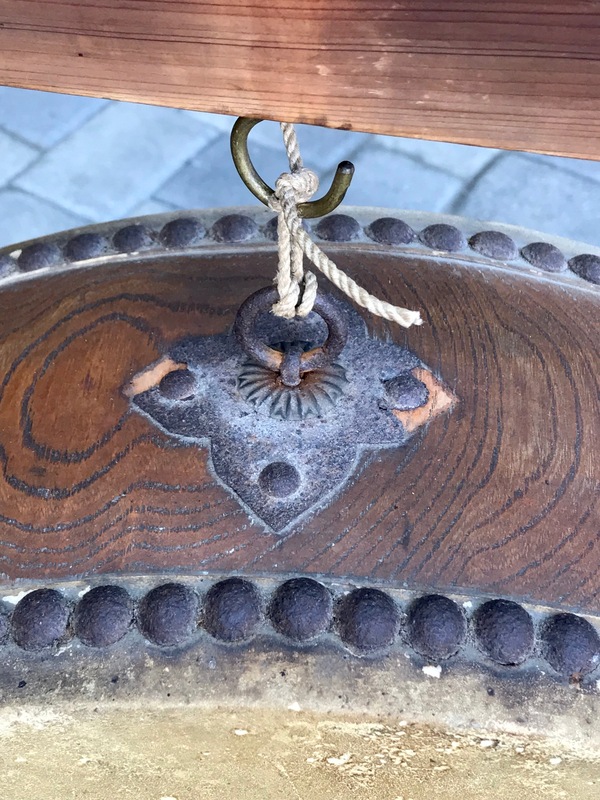 They developed oval-shaped bells that, depending on where they were struck, produced two distinct pitches with an intentional interval between them. 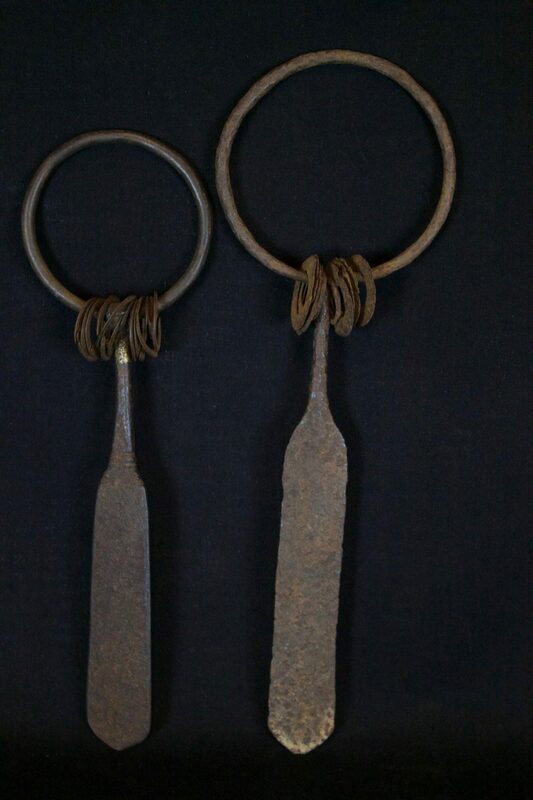 Graduated sets of ‘Bo’ are hung from beam frames and played with a hammer striker. 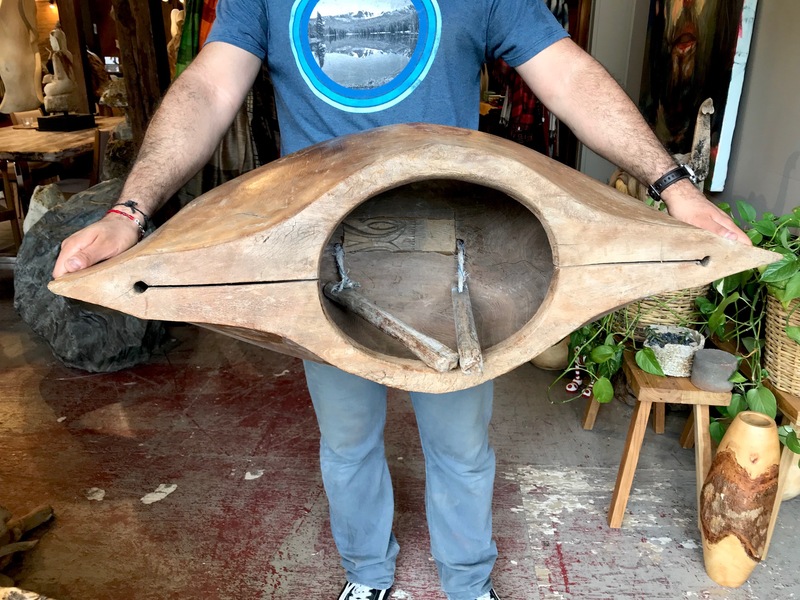 Dimensions: (from large to small) 12 1/2″ x 9 1/2″ x 7″ – $650. 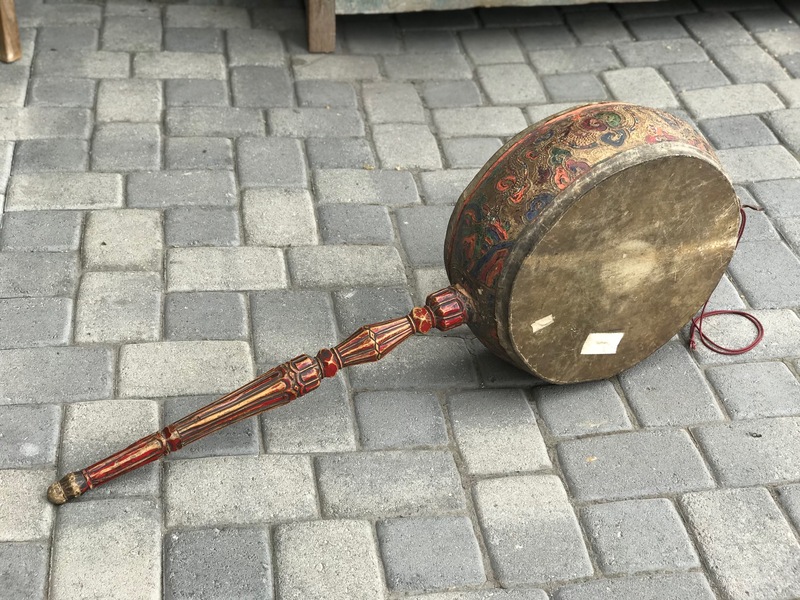 ; 12″ x 8″ x 6 1/2″ – $650. ; 9″ x 5 1/2′ x 3″ – $190. ; 8 1/4″ x 4 1/2″ x 2 3/4″ – $140. 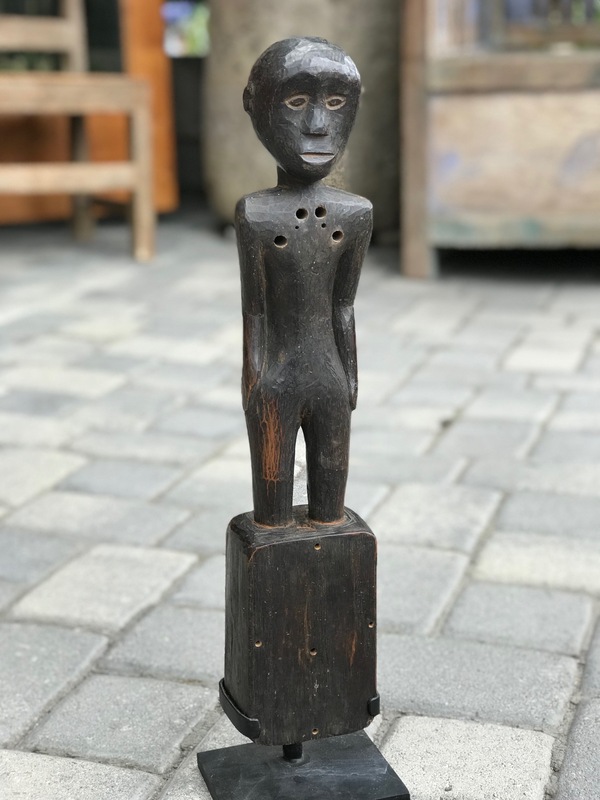 ; 6 1/2″ x 3 3/4″ x 3″ – $100. ; 6 1/4″ x 3 3/4″ x 2 3/4″ – $90. 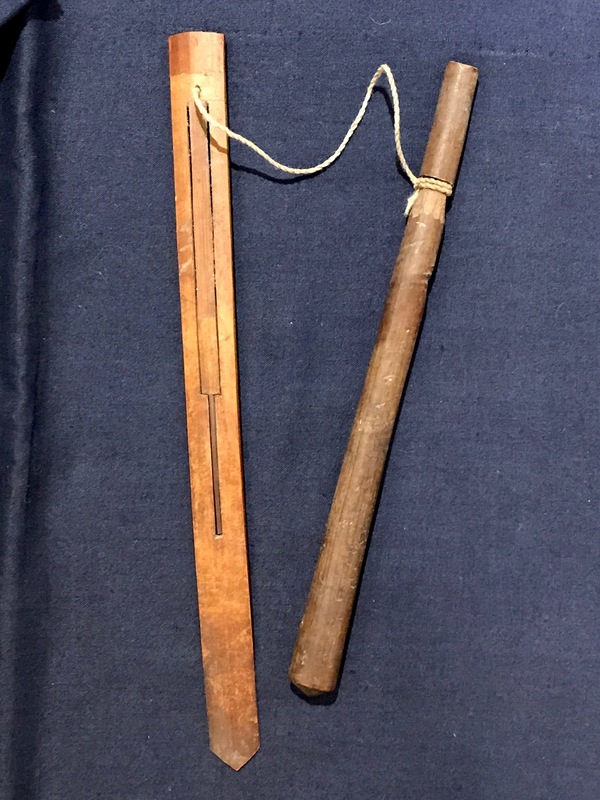 Sasak tribe, Lombok Island, Indonesia, Early to mid 20th c, bamboo, string, played by using the mouth as the resonating cavity and pulling the string to vibrate the bamboo. 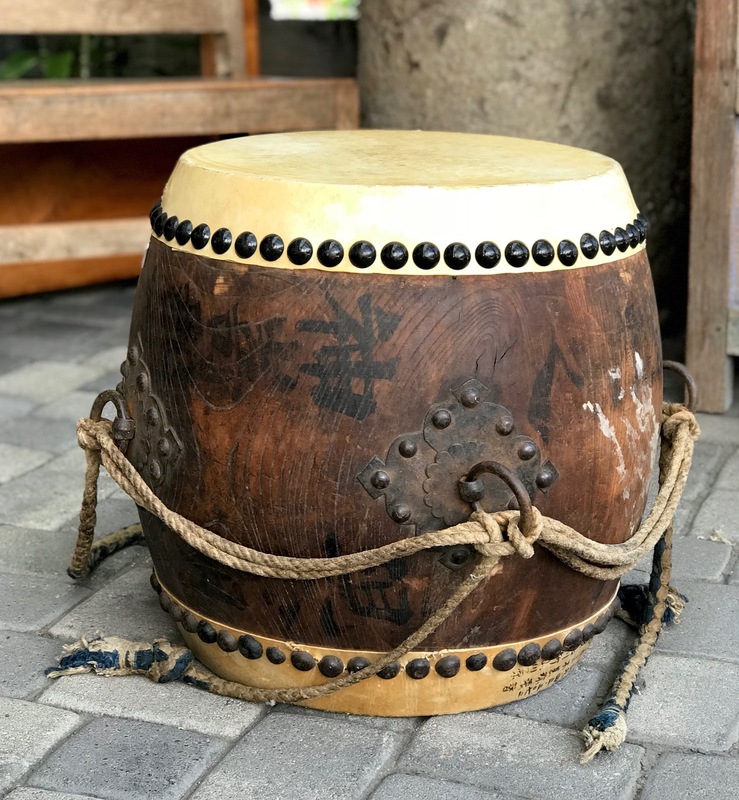 There are many traditional songs written for it. It has been referred to as a ‘mind cleaner’ – because it uses the mouth to resonate, it clears the brain of unclear thoughts. 7 1/2″ x 5/8″ x 1/8″, pull stick – 6 3/4″ x 3/8, $65. 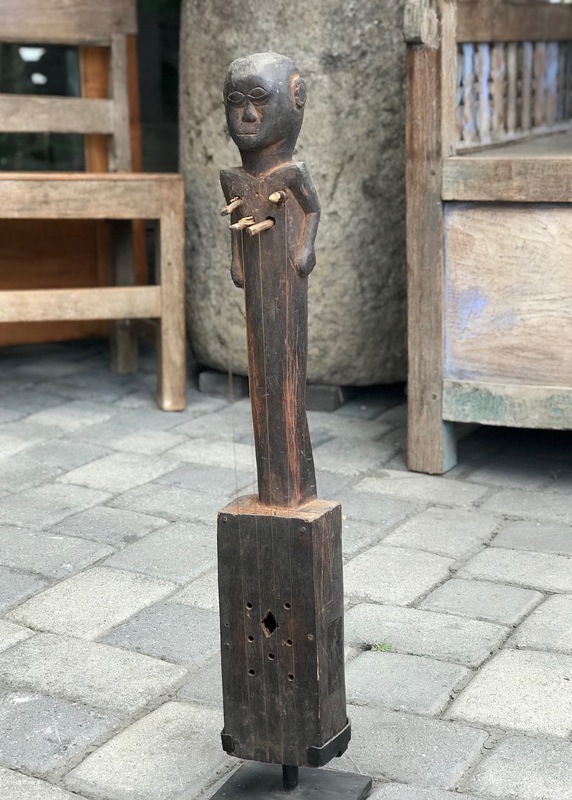 Lombok, Indonesia, Bamboo, string, (for full description see 1st Mouth Harp post), 7 1/4″ x 1/2″ x 1/8″, $60. 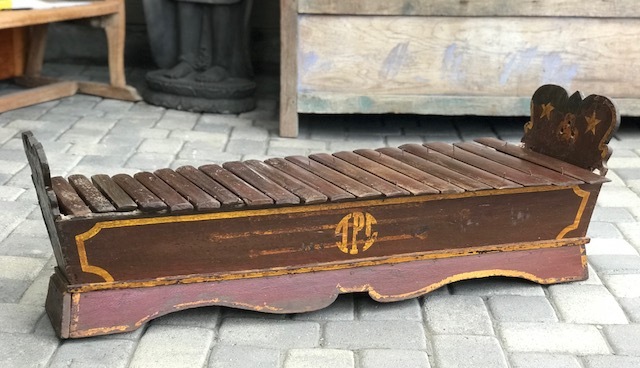 Xylophone or ‘Gambang’, Java, Indonesia, early to med 20th c, Wood, hand carved and painted with 14 metal keys resting on pads made from pieces of a rubber flip flop sandal (footwear), played with 2 padded mallets, and oriented with the larger keys to the left of the player. 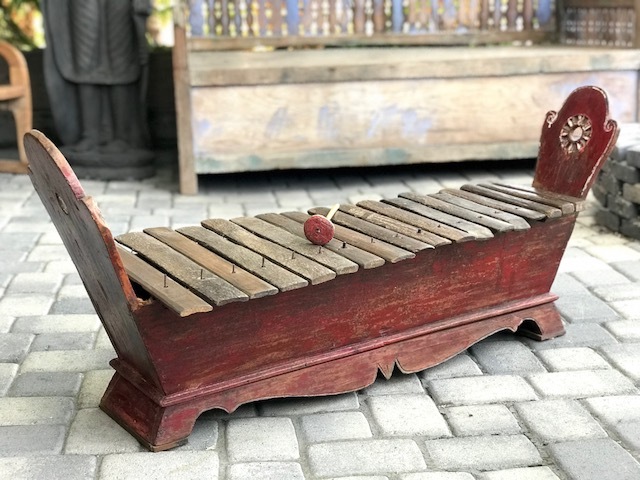 The xylophone is an essential instrument in a traditional orchestral ensemble called a ‘Gamelan’; 13 1/2″ x 40 1/2″ x 6″; $630. 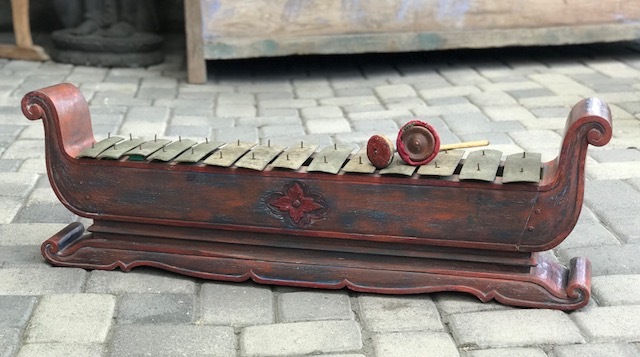 Traditional wooden xylophone or Gambang Kayu, Java, Indonesia, Late 19th to early 20th c, wooden resonating box (grobog), 18 hardwood keys (wilah), played with 2 padded wooden mallets with the larger keys on the player’s left. 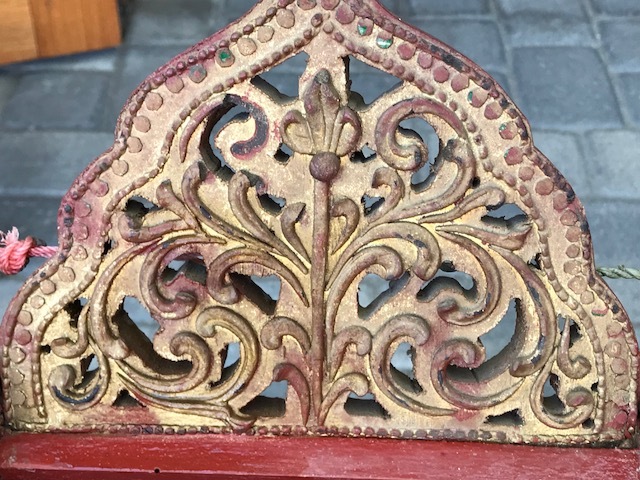 The 2 risers on each end are similarly carved with a simple motif around a circular hole. 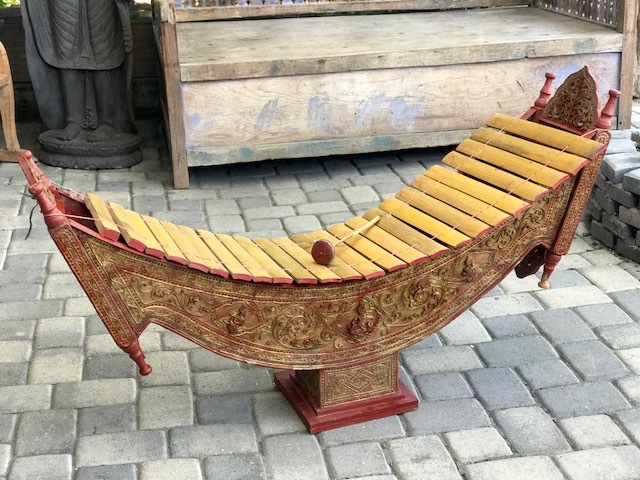 The xylophone is an essential instrument in a traditional orchestral ensemble called a ‘Gamelan’; 23 1/4″ x 52 1/2″ x 18 3/4″; $750. 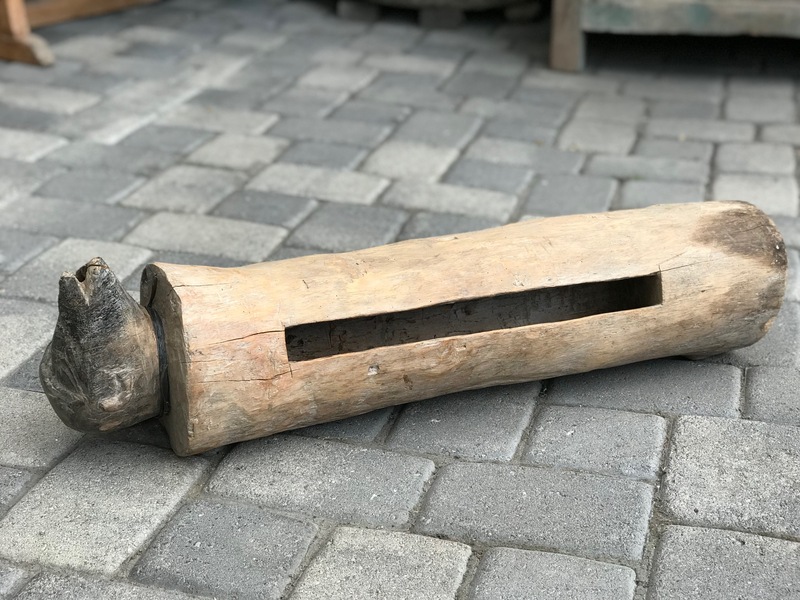 Java, Indonesia, Early 20th c, wooden resonating box (grobog), 20 hardwood keys (wilah), played with 2 padded wooden mallets, the larger keys oriented on the player’s left. 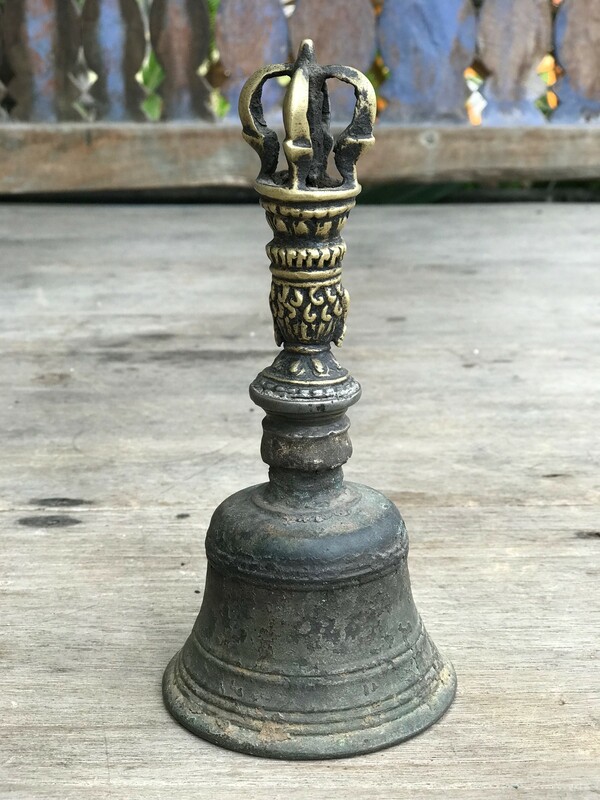 The 2 risers on each end are similarly detailed with a star motif, 3 small circular holes and a monogram on the side panel; it is an essential part of an ensemble called a Gamelan; 16 1/4″ x 49 1/4″ x 19″; $750. 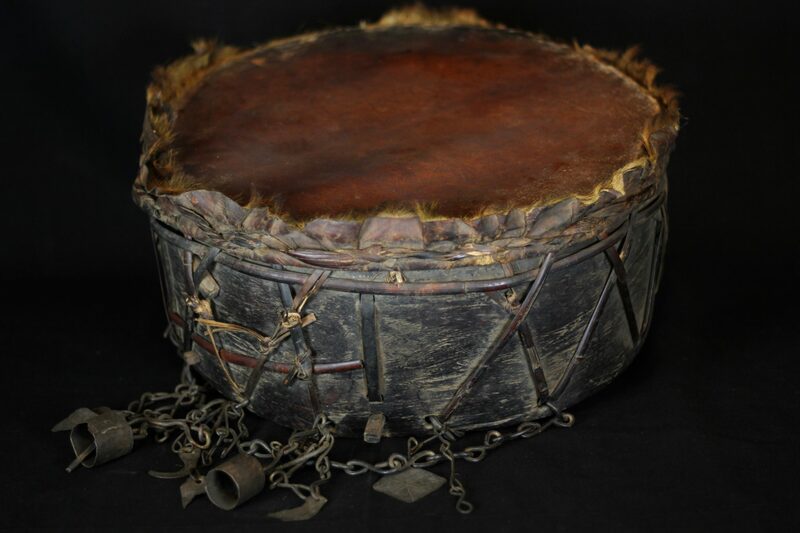 Shaman Ritual Instrument Drum, Nepal, Early 20th c, hide/skin, wood. 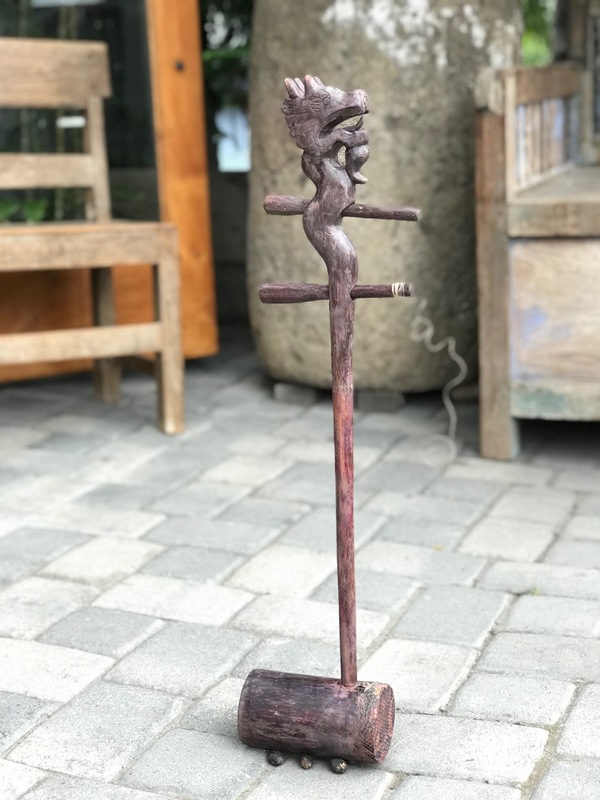 Played by Jhakri (shaman) with a curved stick, to enter and maintain the shaman’s trance for the journey into the spirit world. 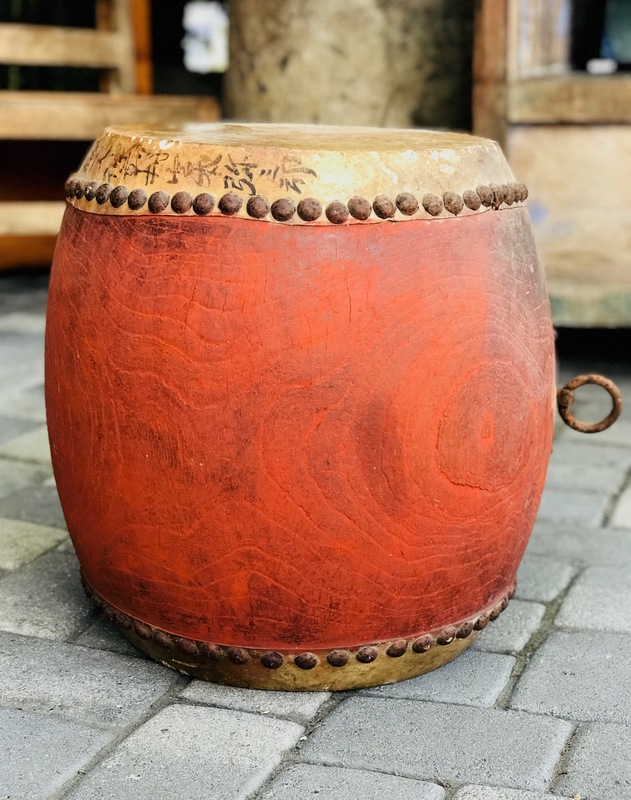 A deity will often reside in the drum during the ritual. 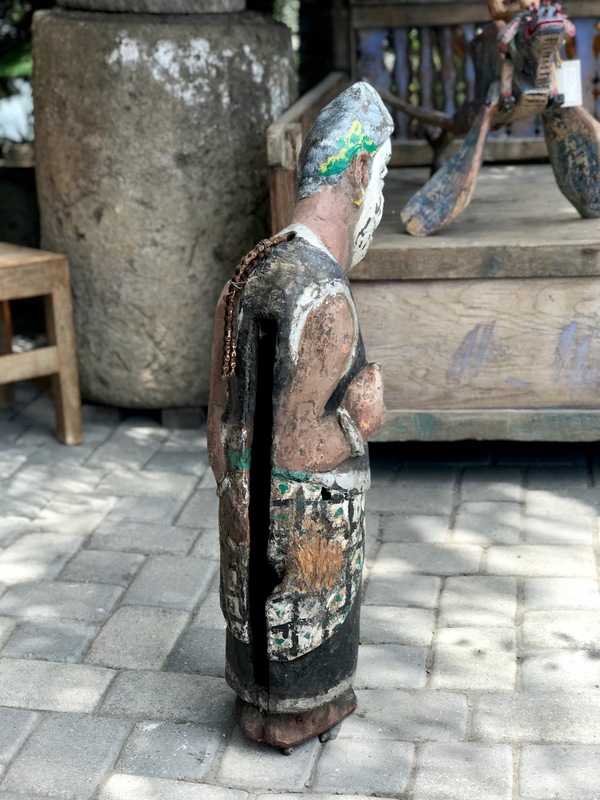 26″ x 14″ x 6′, $900. 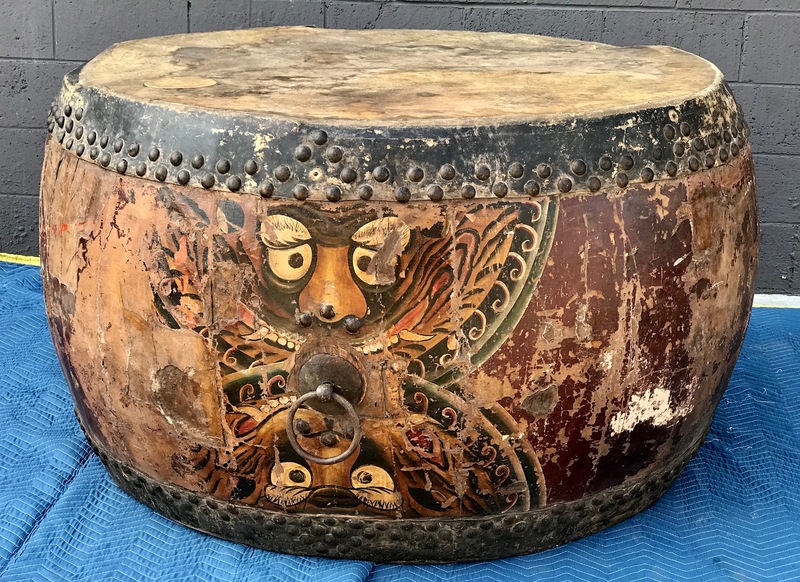 This power drum, associated with Shiva, is used for tantric rituals. 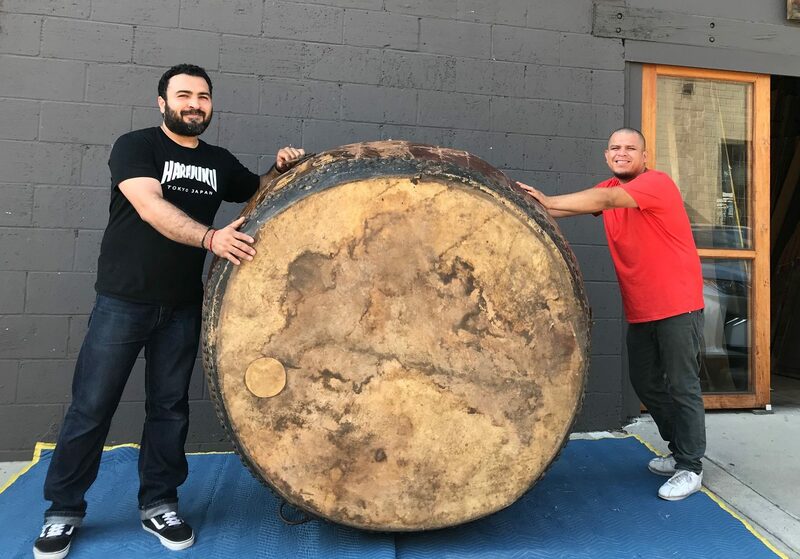 A cord is tied around the middle where knotted ends make the sound when it is played with a twisting motion so the two beaters hit the drum heads simultaneously. 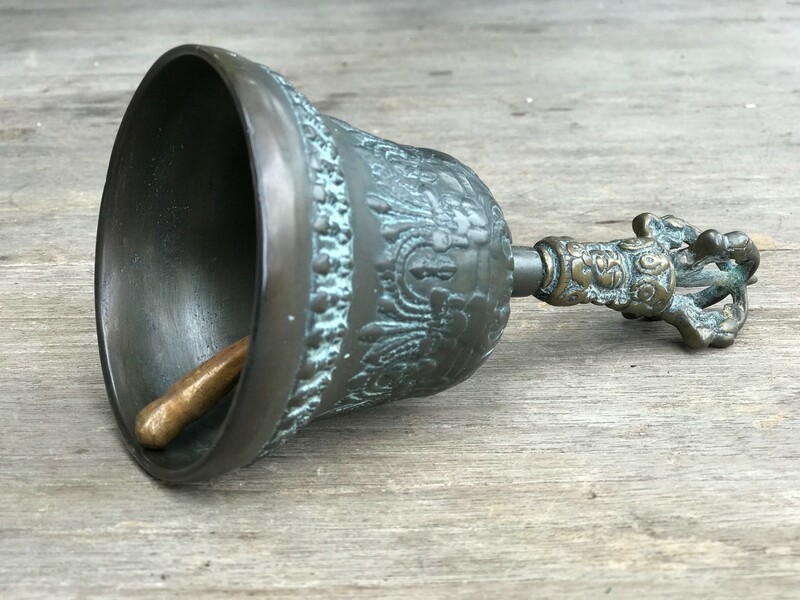 It produces a spiritual sound by which the universe was created and is regulated. The Chopin is typically embroidered with the colors of tantric elements and waves as the drum is played. 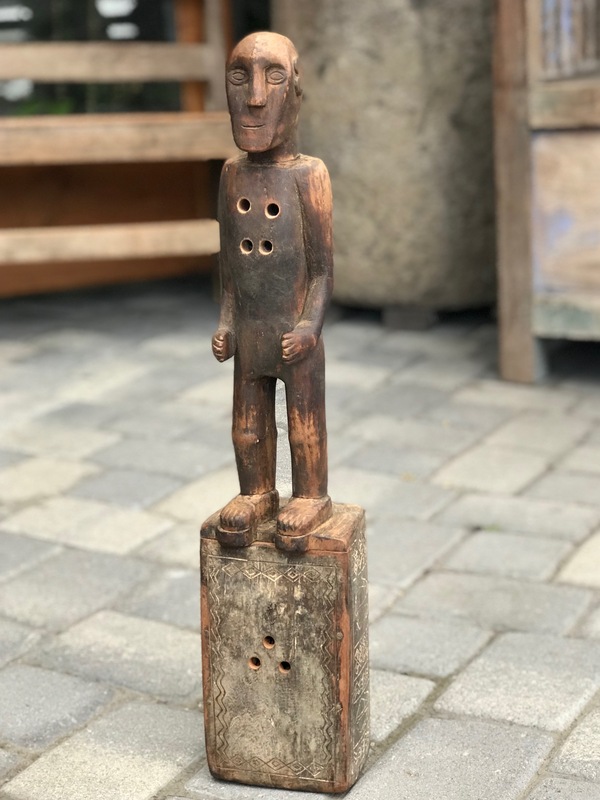 (large) 32” x 11 ¼” x 4 ½”; $700. ; (small) 2” x 5 ¼” x 3” [case 6” x 5” x 3”] $500. 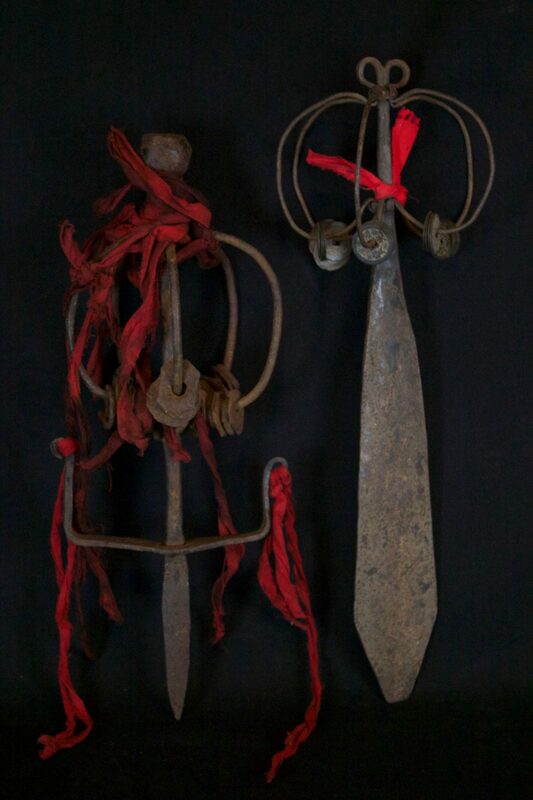 Nepal, Mid to late 19th c., Skin stretched over wood, iron, shaman bells and amulets. 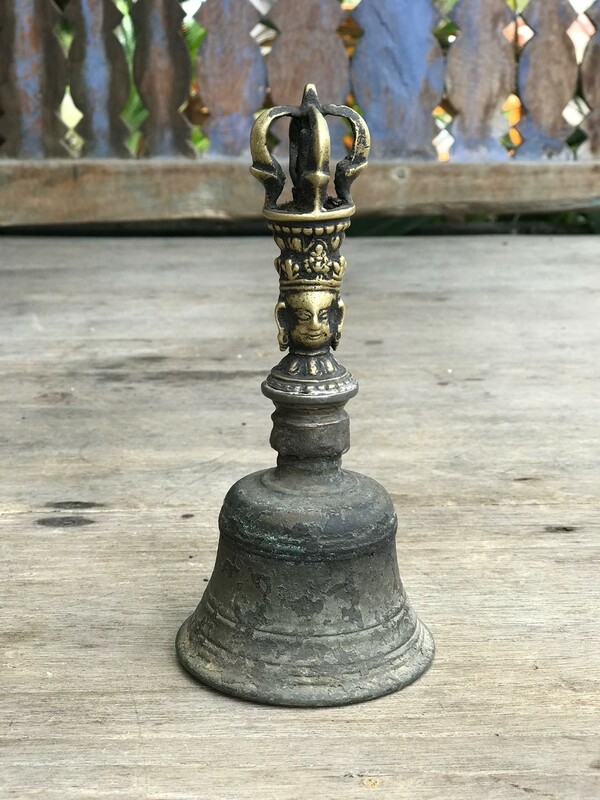 To facilitate entering and maintaining a trance state necessary for the shaman to perform rituals 17 ½” x 8” x 8” (plus 7” bell chains), $1400. 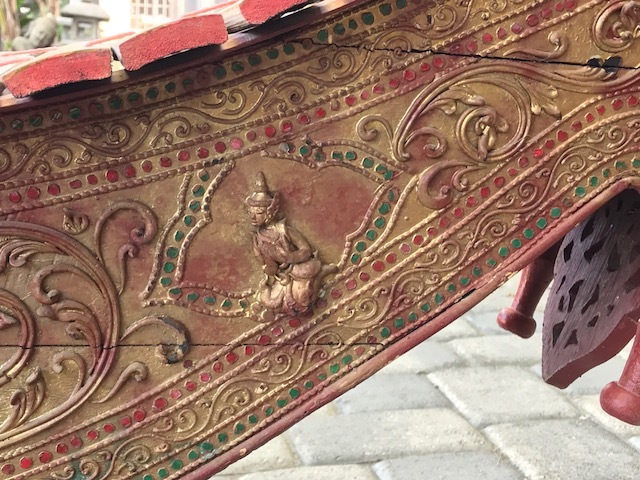 This large belt is an essential part of all Nepalese shaman costumes. 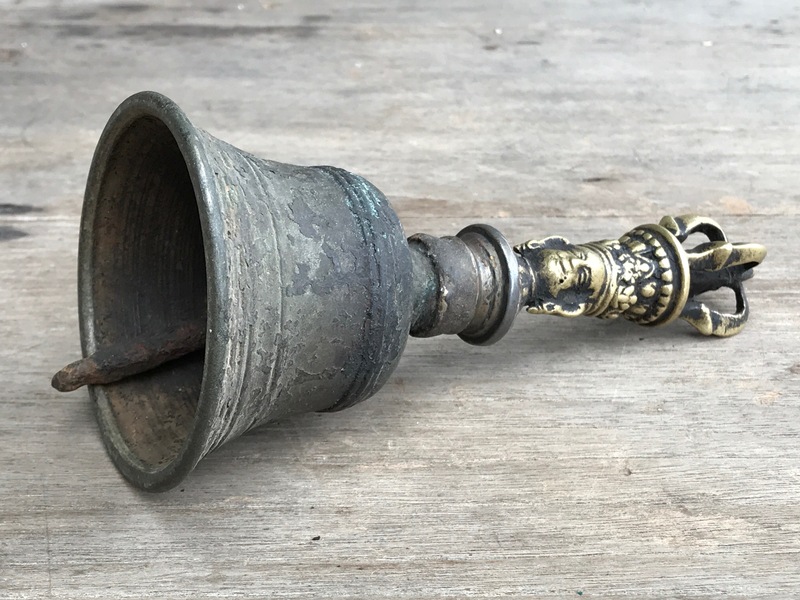 The belt/apron is heavy and loud with all its many parts: leather, iron chain and hand crafted crotal, and cylindrical bells and bangles and the brass conical bells. The cowrie shells, goat horn and wild boar tusk all are symbolic and spiritual tools. 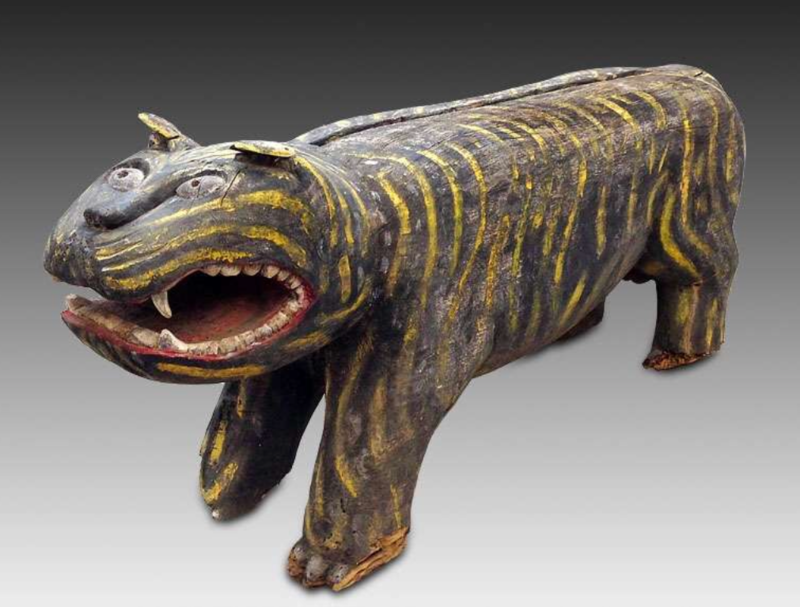 Used in rituals to protect shaman, villagers and the area from witches and other evil beings. (it is a waist belt with hanging bells and over-the-shoulder cross straps). 58” x 32” x 3”, $3200. 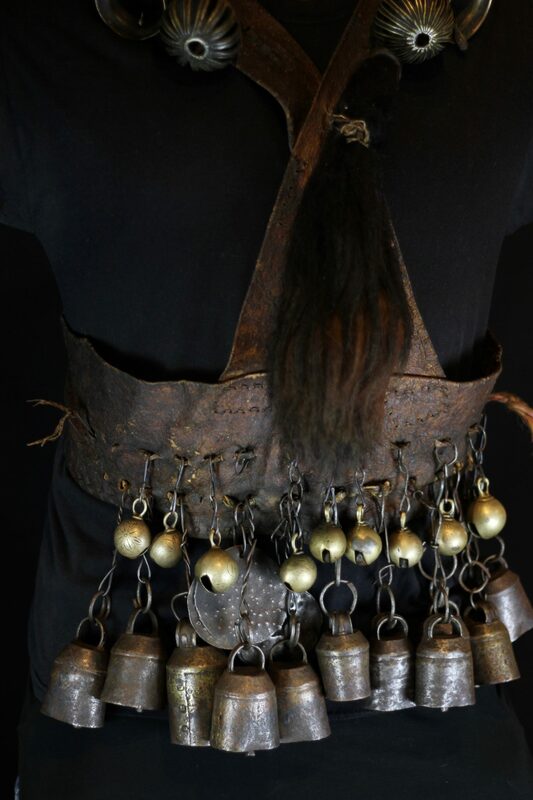 Early 20th c., (some bells up to 150 years old), An essential part of Nepalese shaman costumes, this heavy apron belt is made of hide leather, iron chains, and hand crafted cylindrical bells and bangles, brass conical and crotal bells. 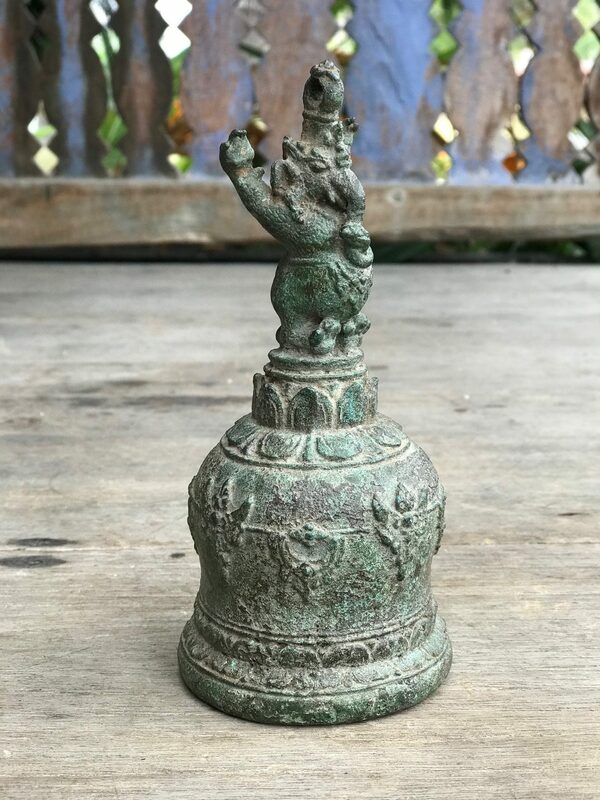 The yak tail, and other amulets which are attached, are powerful spiritual tools. 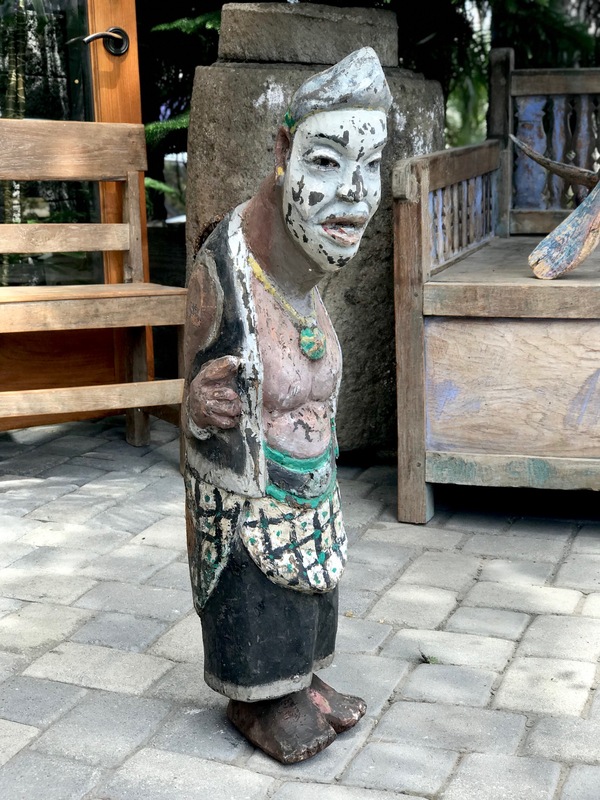 They are worn during rituals and ceremonies to protect shaman and villagers and the area from witches and other evil beings. 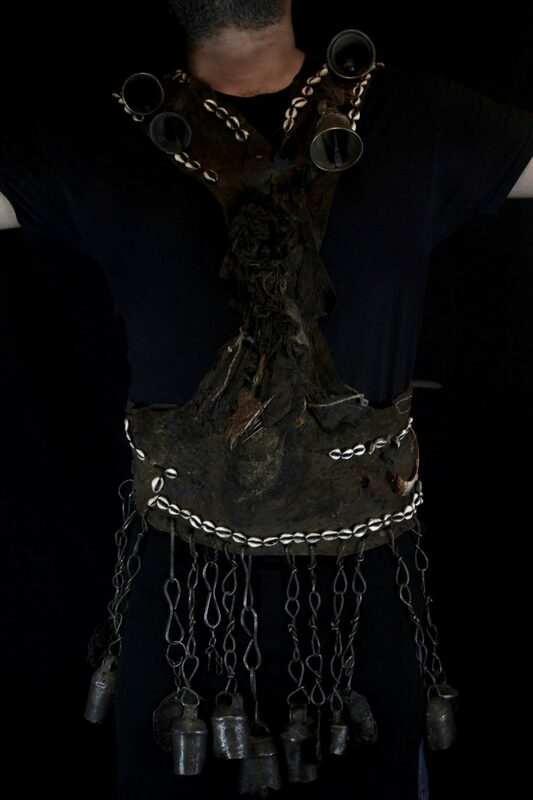 (it is a waist belt with hanging bells and over the shoulder cross straps), 44” x 33” x 3”, $3200. 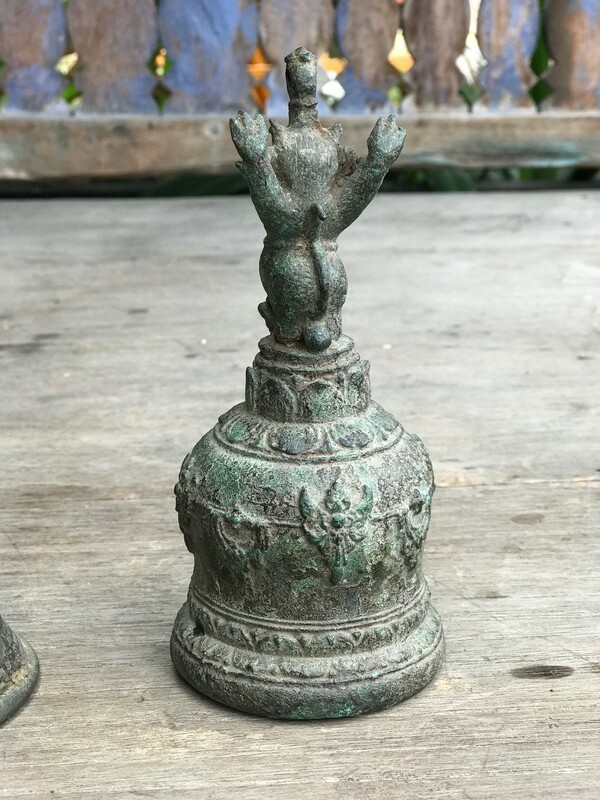 ← Shamanic Talismans, Amulets, Healing and Ritual Power Objects – Tribal Indonesia continued!